If you are a business partner, investor or journalist looking for the latest information about Deufol, here you’ll find our regularly updated news. Deufol opens next generation production facility in Czech Republic. Deufol, global market leader for industrial packaging, opens its new production facility in Cheb, Czech Republic. Only one year after the ground-breaking ceremony: now the commissioning of the new state of the art production facility commenced and will be completed by the end of the year. The opening ceremony took place in Cheb’s industrial area and was attended by the highest representatives of the region of Karlovy Vary, the City of Cheb, as well as the top management of the Deufol Group. The production facility in Cheb is a key strategic milestone in the implementation of Deufol’s strategy. Innovative and highly efficient manufacturing processes enable Deufol to process time critical customer orders, while reaching the maximum value creation. The flexible standardized production of the new industrial packaging is focused on the growing demand of efficient standardized packing materials in the field of sequenced lead times. Here, Deufol combines its competence in design and manufacturing of efficient standardized packaging. The new operation in Cheb lives digital networking and fully implements the Industry 4.0 principles. The startup phase will be completed by the end of 2017. Within the City of Cheb as well as the entire region of Karlovy Vary, over 100 new jobs were generated to further strengthen the profitability of the region. These highly modern production processes will increase Deufol’s productivity and improve its market position significantly. Deufol Group, world market leader in Industrial Packaging, sold their shares of Activatis GmbH in the course of a MBO-transaction. The Deufol Group has sold their shares of Activatis GmbH. The reason for this transaction is the strategic focus on the business area "Industrial Packaging" as well as additional services related to this business area. The spinoff of the Activatis GmbH was carried out through a Management-Buy-Out (MBO) under the lead of the Managing Director, Matthias Flörsch. Activatis GmbH develops and operates as a system partner for custom designed logistics solutions along the supply chain and has more than 30 years of experience in the field of air freight handling and chemical logistics. The recently developed “Smart Logistic Approach” is set to optimize the digitalization and automatization of supply chain processes and is consequently focused on the realization of efficiency increases within Industry 4.0. The management team will be strengthened thru the former KPMG-Expert Thomas Fischer. In his new position as Chief Digital Officer, he will further push the development of the “Smart Logistic Approach”. A smooth evolution of the business activities is ensured by that. Activatis GmbH is a performer of logistic services with a strong focus on Chemical Logistics. Longterm experience and extensive knowledge in the areas of transportation, bottling, and storage in the chemical logistics complete the key competencies of Activatis – Development, operation, process design, and digitalization custom-designed of logistic services in the Chemical Logistics. The clear focus on optimized automatization (Industry 4.0) tops the portfolio off. Deufol SE, the world market leader in the area of industrial goods packaging has announced its acquisition of Novaedes, the leading export packaging company in Belgium, with subsidiaries in Paris France and Butzbach Germany. This strategic expansion of the Deufol network will allow the industrial export clients of Deufol and Novaedes to take full advantage of the newly combined services offerings. “The resulting enhanced physical presence in central Europe for offering logistics and packaging services in close proximity to our customers as well as the strategic expansion of the Deufol Hub Network in the Port of Antwerp underline the strategic importance of our acquisition. Together, with our innovative, digital, real time packaging and logistics solutions, this strategic step shall further enhance the transparency and reliability of the supply chain of our global customer base and therefore help them drive their own competitive advantage in today’s global economy.” Says Dennis Hübner, Executive Director and Member of the Board of Deufol SE. Additionally, the acquisition will allow the cross fertilization of existing and future service portfolios while enhancing our combined geographic presence for the customers of both companies. Novaedes has vast experience in providing packaging and logistics solutions for the oil & gas, process industry and medical equipment, while Deufol’s customer base originates from more traditional machinery and capital equipment sectors as well as power generation industry. Deufol Austria, a wholly owned subsidiary of Deufol SE, the world market leader in the area of industrial goods packaging, and RIEDER®, full range supplier in the field of packaging services, will merge retroactively as of January 2016. With this step Deufol SE expands its global network of IT-based packaging and logistic solutions in the area of industrial goods packaging further. The new jointly formed company has got, in addition to its market leadership in Austria in the areas of wooden crating, transport/loading as well as special services, a strong and internationally acting partner with the Deufol SE. Goal of this merger is to provide even better, more specialized and more customer specified packaging solutions to the Austrian market, as well as to utilize the customizable IT-solutions of the Deufol-Data-Connect tool box within the framework of Industry 4.0. The international Deufol network has grown meanwhile to 87 operations in 11 countries distributed over 3 continents. This step assures a competent pooling of high-level expertise and further increases the capabilities of the Deufol Group. This will benefit the national, as well as international, clients of the Deufol Group of companies. Deufol, global market leader for industry packaging, constructs new production facility in Cheb, Czech Republic. The groundbreaking will take place on July 13, 2016. The production start is planned for spring 2017. The team around Vítězslav Dovrtěl, responsible for Europe East within Deufol SE, initiated the project and will be supported by Pavel Dynda, Project Manager and Pavel Dosedla, as future Operation Manager. The 81st Deufol operation will be embedded in a geographical central position of the European network. Industry 4.0 required digital networking as well as flexible and highly automated series production. The reduction of “Time-to-Market” packaging made the decision for the investment in a new operation necessary. “We will clearly increase our productivity at this new operation through innovative processes and the integration of the digital control in the manufacturing process of the company and significant improve our market position.” says Dennis Hübner, Executive Director of Deufol SE. Deufol offers all customers with its in-house developed software interfaces to all known ERP-Systems an “End-to-End-Solution”. Here, the customer receives a “Real-Time-Visibility” of all relevant data – from the supplier to the point of the actual assembly on site worldwide. At the end of August, the recruiting campaign will start. "Before we start with our production, we will provide a comprehensive training to our employees," reports HR-Manager Czech Republic, Jitka Zimolková, adding, that the modern corporate culture of Deufol, offers all employees immense development opportunities and promotion prospects. PRESS RELEASE Deufol SE: Partnership SINOTRANS PACKAGING AND LOGISTICS / DEUFOL (SUZHOU) PACKAGING Co. Ltd.
On April 15th, two of the strongest companies in Industrial Packaging, Logistics, Transportation, and Supplementary Services joined together in a cooperation agreement intended to allow the companies to offer an unmatched set of logistics, transportation, and packaging services to clients with global needs. This cooperation got now approved by the Board. RDCs – in Beijing, Guangzhou, Chengdu, Shanghai, Shenyang, and Nanjing. When combining this robust set of skills, the partnership now provides Companies with manufacturing units in China with services that not only package and move products, but do it with complete range of custom solutions that gives visibility, technological tracking, and even on-location services - where the client is, when the client needs it. This optimization will reduce time, handling, warehouse and transportation costs for domestic and export services in China. The partnership also plans to expand possibilities to offer both on-site packaging services as implementation of new production facilities in the vicinity of key customer clusters. The project logistics department Sinotrans Heavy Lift will also enable Deufol (Suzhou) Packaging Co. Ltd. to offer their customers door-to-door services. This will include packaging, heavy lift, inland water and or road transport throughout China and will ensure the most cost efficient means of packaging and transport. With this new initiative, both Sinotrans Logistics and Packaging Co. Ltd. and Deufol (Suzhou) Packaging Co. Ltd. are committed to becoming one of the most important market leaders in terms of packaging and integrated logistics in China. Deufol SE wishes to thank Ms. Maggie Meng - General Manager of Sinotrans Packaging and Logistics Co. Ltd. - for her on-going support in this joint development between Sinotrans Packaging and Logistics Co. Ltd. and Deufol (Suzhou) Packaging Co. Ltd.
Sinotrans Limited is a logistics service provider in the People’s Republic of China. It operates in five segments: freight forwarding, shipping agency, marine transportation, storage and terminal services and trucking. The Agreement refers to a partnership agreement between Sinotrans Packaging and Logistics Co. Ltd., a subsidiary of Sinotrans Limited, and Deufol (Suzhou) Packaging Co. Ltd., a subsidiary of Deufol SE. The Administrative Board and Dr. Tillmann Blaschke have jointly agreed, that Dr. Blaschke will leave the company at the end of February. Dr. Blaschke is departing for personal reasons. His successor as Managing Director from March 1 onwards will be Mr. Klaus Duttiné (48 years old), who will take over responsibility for the Finance and Legal departments. In accordance with corporate statutes, Marc Hübner will replace Dr. Blaschke as a Member of the Administrative Board. Our new recruit, Mr. Duttiné, is a business-oriented commercial professional. Mr. Duttiné comes from the consulting corporation Ebner Stolz, where he was a Partner. Mr. Duttiné has extensive industrial and consulting experience, with a focus on structuring in the last years. “We are pleased to have Mr. Duttiné on board and expect that he will have a decisive influence on the future development of Deufol, especially due to his experience in processes and structuring,” Hübner stated. Olaf Lange (45) will join the management of Deufol SE effective on 01 June 2013. As a member of the management team, he will bring his expertise to bear on the continuing development and growth of the export and industrial goods packaging business of the Deufol Group and play a key role in the development of the company’s business. Olaf Lange can thereby draw on the extensive experience in the industry he gained especially during his 12 years as Managing Director of Senator International Verpackung GmbH. Deufol SE and Meilink-Group, both market leaders for industrial packaging in their respective home markets Germany and the Netherlands, have agreed to form a joint venture specialized in innovative packaging solutions as well as commencing a strategic alliance. Combined, the respective strengths result in a unique range of products and services for their collective customer portfolio. The diversity of both companies especially with regards to the regional presence, their differing product portfolio, as well as customer base and know-how provide a significant advantage to both companies aligned. Specifically, Deufol’s unique IT and software solutions providing customers state of the art Supply Chain Monitoring Systems combined with standardized crate engineering and special crate production for heavyweight goods packing are now combined with Meilink’s vast know-how in clean-room packaging technologies, alternative corrugated and high-tech packaging solutions as well as project freight forwarding and handling. The exclusive agreement allows both companies to align their strategy going forward with the main goal to keep increasing the added value for their customers. Their focus will lie upon the combined development and use of each other’s IT systems and innovative packaging solutions. Additionally, both companies will leverage the enhanced global market position in order to further develop their international network with uniform business processes and services. As the result Deufol and Meilink will be able to offer an even wider range of product portfolio to their customers on an international basis. Meilink Group is a family owned company and market leader in the Benelux region for export packaging, high-tech packaging, heavy duty corrugated packaging and project forwarding. Headoffice in Borculo and with six other locations in the Netherlands. With 350 people (300FTE) in 2012 a turnover of 55 million was achieved. Axel Wöltjen makes his knowledge available to the Deufol SE again. He had already been a responsible member of the management team of several companies belonging to our group from 1991 until 2004. As a shareholder, Axel Wöltjen is supposed to hold a seat in the SE Board of Directors as non-executive director at the earliest opportunity possible. As an authorized representative, Axel Wöltjen will present Deufol SE’s interests to the outside world in various functions. Deufol is looking forward to a friendly and fruitful cooperation that Axel Wöltjen is also ex-pectant of. The former Deufol AG company, of Hofheim, gives notice that it has successfully completed its transformation into Deufol SE (Societas Europaea or European Company) on the basis of a new entry on the Commercial Register. In parallel to this, Deufol SE will be introducing registered shares in the coming weeks, with a view to making its shareholder structure more transparent. In conjunction with the transformation into an SE, resolved upon at the Annual General Meeting of 4 July 2012, Deufol is also introducing a Management Board based on the monistic system. The executive directors who function as members of the Deufol Management Board are Detlef W. Hübner (Global Strategy / Operations), Dr Tillmann Blaschke (Business Development & Customer Relations, Marketing & Communications, Finance, Legal & Compliance) and Dennis Hübner (Production, Operational Excellence, Human Resources, IT Services). Jens Hof (Purchasing, Property, Admin & Support), Manfred Weirich (Europe North) and Jürgen Schmid (Europe South) have been appointed as additional executive directors. The SE transformation shows Deufol emphasizing the significance of its international business and the variety of the Group’s corporate culture – the company now has branches in ten different countries. The corporate head office of Deufol SE continues to be in Hofheim, in Germany’s Hessian region. This is also the base from which the business affairs of the Deufol Group will be managed in future. The Deufol Group is underlining its commitment to continuing internationalization by setting up a World Board, on which the different regions are represented. The World Board of Deufol SE will codetermine strategies throughout the Group, coordinate best practice sharing and press ahead with business development on a global scale. All executive directors are members of the World Board, as also are the regional representatives Bill Morgan (North America), Ron MacDougall (North America), Alessandro Olivieri (Italy, France), Ronald Schrooten (Benelux), Vitezslav Dovrtel (Europe East) and Frank Ghesquiere (Asia). The new Deufol SE will have labour representation at European level in the form of the SE Works Council. This will make it easier for all company employees in Europe to contribute to the discussion of topics relevant to the Group as a whole through their different regional representatives. Due to our participation in the German Equity Forum including a presentation and meetings, the quarterly conference call will not take place. In case you are interested in further information, please call Claudia Ludwig (+49 6122 501228) who will directly transfer your concern. Deufol AG, Hofheim, appoints Frank Ghesquiere (41), Asia expert and packaging & logistics professional, as new Head of Asia & Pacific as of November 1, 2012. In his new position, Frank Ghesquiere is responsible for the management and development of all the Deufol Group’s business activities in the entire Asian region. Frank Ghesquiere possesses over 14 years of experience on and extensive knowledge of the Asian market. During the past seven years, Frank Ghesquiere has been based in Shanghai, working as Logistics Director for the world leader in the steel industry. Previously, he accompanied the build-up and market expansion of the Asian business for a Belgian warehousing and packaging company in the field of chemicals and consumer goods based in Singapore since 2000. From the Shanghai metropolitan region, Ghesquiere will particularly develop the business units Packaging Logistics and Warehouse Services on the Chinese market. In Singapore, the focus is on the Deufol services Automated Packaging, Data Packaging and Supplementary Services. By recruiting Frank Ghesquiere, Deufol underlines the importance of Asia for the group’s further growth. Deufol AG, Hofheim, has founded the company Deufol Asia PTE. LTD. in Singapore on September 6, 2012. The new enterprise is a wholly owned subsidiary of Deufol AG which will active-ly support the group’s growth by extending the comprehensive Deufol service portfolio to the Asian region. Here, the focus particularly is on Automated Packaging, Data Packaging and Supplementary Services. Thereby, the Deufol Group further expands its international leading role in the field of packaging solutions and supplementary services. In addition to the company’s activities in China, Singapore is intended to become Deufol Group’s basis for further expansion into Asia. Offering the world’s second largest transshipment port, Singapore itself also is of particular economic interest to Deufol. Deufol AG is taking legal action against former senior managers. Hofheim (Wallau), April 4th, 2012. Today, the board and the supervisory board of Deufol AG, Hofheim, filed a criminal complaint with the district attorney of Frankfurt am Main, Germany, against the former managing director of its subsidiary Deufol Tailleur GmbH, Manfred Wagner, against Deufol AG’s former chairman of the board, Andreas Bargende, two other people from his personal circle, as well as against the former general counsel of the company, Wolfgang Gluecks. The district attorney in Frankfurt am Main has commenced investigative proceedings under case no. 7210 Js 216358/12 WBW. The defendants are being accused of having collectively caused the Deufol Group considerable economic damages between 2006 and 2011 for their own personal benefit via a complex network of firms and holdings. Damages presently amount to low two-digit millions of Euros. There is a suspicion of bribery, embezzlement of company assets, and payments of both inflated rents for commercial real estate and inflated purchase prices in connection with company acquisitions. Those sus-pected here are Manfred Wagner and Andreas Bargende, who are supposed to have benefitted in the form of personal financial gains as a result of their collusion with each other on account of their far-reaching directorial powers within the company itself. All questionable actions took place in the past and are reflected in the previous fiscal years of Deufol AG. According to the conclusions of the present investigation, clients of the Deufol Group have not been caused any damages on account of the irregularities. The suspected persons were immediately removed without exception from the company as soon as the suspicions came to light. In the wake of these developments, the facts of the matter have been established with the aid of external experts. Deufol AG is taking legal action against those mentioned above in both criminal and civil court and is confident that it can enforce its claims for damages. The Deufol Group is expanding its presence in the USA and has just opened a new operation in Charlotte, North Carolina. A long-term contract for providing services in the area of Export & Industrial Goods Packaging has been concluded with Siemens, which has expanded its nearby production plant for gas turbines. For the first time in the USA, Deufol is handling packaging services in this core area. Hofheim (Wallau), July 22nd 2011. In Charlotte, Deufol is packaging parts for gas and steam turbines and generators, which are destined for both the US market and for export throughout the world. Material that is used in the manufacturing of steam turbines and generators will be received at this new 125,000 square feet warehouse and delivered to point of use in the Siemens factory when requested. Only a few miles away, Siemens has constructed a modern facility that will become the largest gas turbine production plant in the USA once its expansion has been completed by the end of this year. For the first time, Deufol is now packaging export and industrial goods in the USA, a service area not previously covered there. The new business is handled by the newly founded company, Deufol Charlotte LLC. As part of Deufol’s overall growth strategy, it will serve as a starting point for further development of activities in the area of Export & Industrial Goods Packaging. PRESS RELEASE Deufol’s "Gift Cards & Data Management" service division receives its first European packaging order. The Deufol Group is pleased to announce the arrival of its "Gift Cards & Data Management" service on the European market. Deufol is packaging the "mywirecard 2go Visa" cards for Wirecard Bank AG, whose rechargeable prepaid cards can effectively be used as currency all around the world. Hofheim (Wallau), May 30th, 2011. Deufol is now also packaging prepaid cards for a German customer, the Munich Wirecard Bank AG, a subsidiary of the stock-quoted Wirecard AG. The packaging and service facilities necessary to enable activation of prepaid cards via scanning in places such as gas stations and convenience stores have been developed by Deufol. 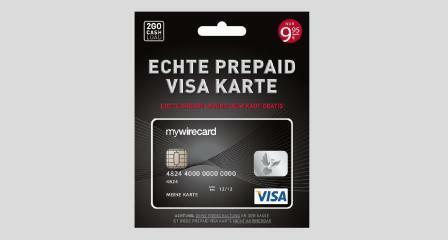 The "mywirecard 2 go Visa" prepaid cards are mounted on a piece of cardboard and sealed with a blister. An opening on the back of the cardboard mount provides access to the barcode on the card, already contained within its packaging, so that it can be activated via a barcode scanner. The prepaid cards of Wirecard Bank are available at retailers throughout Germany and can be directly loaded with an initial credit amount at the time of purchase. That way products on the internet can be ordered quickly and securely. Deufol has its own machines that are able to meet the challenging requirements of data processing for packaging gift cards, which primarily involves packaging cards in multipacks. So far, the Deufol Group has only provided packaging services in the "Gift Cards & Data Management" sector for American customers. Now the group could win its first European partner for this sector. The Deufol Group has opened a new operation in the Italian municipality of Roverbella on a site directly neighbouring Kosme, the subsidiary of Deufol's customer Krones AG. Deufol Italia S.p.A., the Italian division of the Deufol Group, signed a long-term contract with Kosme regarding packaging solutions for beverage filling machines. Hofheim (Wallau), March 1st, 2011. In Roverbella, Deufol packs filling units, palletisers, de-palletisers, labelling machines - all of the complex product groups which Kosme S.R.L. distributes around the world from its base in Roverbella. For Deufol, this means that packaging for global transportation needs to meet extremely high standards to guarantee the sound condition of the machines until the contract has been fulfilled. Deufol designs each type of packaging as an individual solution, taking into account various conservation procedures for long-term packaging, climate and statistical conditions during transportation, the requirements of the destination country and much more. The packaging services are mainly processed in Deufol’s own operation center of 2.500 square meters and 2.500 square meters of free space, which directly neighbours the Kosme production facilities. Deufol will also take over in-house/outsourcing services directly within Kosme's production facilities. The partnership between Krones and Deufol began in 1997 with the packaging of conveyor belts at the headquarters of Krones AG in Neutraubling near Regensburg. Over the years, a trusting partnership has developed, on the basis of which Deufol was not only able to extend its range of services, but also expand with more operations across Germany. The opening of the Italian operation in Roverbella has enabled the first ever customer-specific geographic expansion across country borders - an initial success in Deufol’s expansion strategy. As a global supplier of packaging services, Deufol has benefited from its existing Italian business while making this step. Deufol Italia S.p.A., based in Fagnano Olona, which previously operated mainly as a provider for packaging and related services for stationery products and fashion jewellery, is also processing this business in the area of export and industrial goods packaging at the new Roverbella operation. Deufol acquires Richard Wolfsberger Verpackungen GmbH. The Deufol Group has acquired 100% of the Austrian company Richard Wolfsberger Verpackungen GmbH. The company Wolfsberger and the existing Austrian subsidiary Logis Industriedienstleistung GmbH will be merged into the Deufol Austria GmbH, based in Bruck an der Leitha. Hofheim (Wallau), February 01st, 2010. The company, which will operate under the name Deufol Austria GmbH, provides packaging services and associated services ranging from storage to dispatch handling, specialising in the field of export and industrial goods packaging. Factory space of 7,500 square meters is available in Bruck an der Leitha. A covered area of 500 square meters and clear space of 48,000 square meters is also available, on which industrial goods up to a weight of 150 tonnes can be packed individually. It is also possible to deliver, load and transport the goods further by train using the direct rail connection. This transaction is a further step within Deufol’s growth strategy, with which the German market leader aims to expand abroad. The operation in Austria will create an additional bridge to the East European market and is of significant importance for Deufol as a global supplier of packaging services. “This connection with Deufol is our big opportunity to become involved with an international, growing company, providing our own expertise and developing further in the global market", commented Richard Wolfsberger, associate of the former Richard Wolfsberger Verpackungen GmbH and Managing Director of the new company operating under the name Deufol Austria GmbH. PRESS RELEASE D.Logistics becomes Deufol. D.Logistics is history. The specialist in packaging and related services will from now on be trading as “Deufol Aktiengesellschaft”. The companies within the group will also be brought together under the standard umbrella brand Deufol. The change of name from D.Logistics to Deufol highlights the group's consistent growth into an international industrial service provider that offers intelligent and customised services, strategies, concepts and solutions relating to its core field of expertise, packaging. Hofheim (Wallau), 01 December 2010. As part of an extensive renaming process, D.Logistics AG, based in the Hessian town of Hofheim (Wallau), has been renamed to Deufol AG. Consequently, all subsidiaries in Germany and abroad will be brought together under the new brand Deufol, in order to provide the group with a standardised presence to the outside world. Along with the new name, all companies in the group will be given a standardised brand profile and can be found on the Internet via the central, international web presence www.deufol.com. By choosing Deufol, the group has not picked a random, fantasy name. Originating from the fusion of “deutsche Folie” (German film / German blister), the name stems from around half a century of tradition in export packaging and has been a tremendous success in most sectors of the company’s existing business. “The introduction of the standardised brand is an important part of our growth strategy. As Deufol, we will not only develop our business on a regional basis, but we will also be able to offer our services on a global scale,” says Andreas Bargende, CEO of Deufol AG. The name change was approved at the annual general meeting in June 2010. The reorganization of the Group and the concentration of the business towards industrial packaging is progressing successfully. This step will further strengthen our profile in the customer perception as being the acting specialist in industrial packaging with an own global network. All acquisitions made recently serve consequently the objective to further expand our network. The separation of the Activatis GmbH and major customers in the consumer packaging segment are further logical consequences of Deufol to concentrate on our core competence - industrial packaging. Investments in innovative, necessary IT, as well as the continuous strategic expansion of industrial packaging services, are the main focus of the Deufol-Group. In the first half of 2017, sales were € 145.1 million, 10.4% or € 16.8 million below prior year.The change in sales are based upon the change within the group of consolidated companies, as well as the sale of a large operation in Belgium, in line to return the strategic focus on industrial packaging. The additions within the group of consolidated companies of industrial packaging increased sales of € 18.0 million. The sale of the Activatis GmbH and consumer packaging in Belgium decreased sales by € 21.6 million. Excluding these non-recurring items, sales are down to € 13.2 million. Through adjusting the appreciation of the US-Dollar against the Euro of about 3.0%, sales increased in US-Dollar of € 1.0 million, sales declined by € 14.2 million. The operative result (EBITA) amounted to € 4.3 million and therewith ca. 20.0% below prior year (€ 5.3 million). This result, on the one hand, was due to the acquisitions and its adjacent costs, and on the other hand, due to the integration of the new operations, which just started. The period result was € 3.0 million (prior year € 3.3 million). After deduction of the dividends of noncontrolling interests, the net profit decreased to € 3.0 million for the Shareholders of Deufol SE, vs. € 3.2 million in the prior year. The earnings per share was at € 0.070 for the first three months (prior year € 0.073). The operative cash flow of the Deufol-Group amounted in the reporting period to € 9.0 million and was tangible above the prior year level (€ 2.7 million). The financial liabilities increased within the first six months 2017 of € 0.3 million to € 66.1 million. The net financial liabilities, defined as a sum of liabilities less financial receivables and currency, were stronger (€ +2.9 million) due to increased cash, from € 46.9 million on December 31, 2016 to € 45.2 million at the end of the reporting period. Deufol SE will correct their published planning for the fiscal year 2017, as mentioned in the annual financial report 2016, slightly down. Reason for this correction is the restructuring of the business in the USA – away from consumer packaging towards industrial packaging. This change will impact sales in this segment within the second half-year accordingly. We now expect sales within the range of € 280 million and € 300 million and an operative result (EBITA) between € 14.0 million and € 16.0 million. On 13 May 2016 the executive directors of Deufol SE, Hofheim (Germany), have resolved to repurchase up to 1 Million notional no-par value shares of the company on the basis of the authorization issued by the General Meeting of Shareholders on 1 July 2015 to acquire and utilize own shares in accordance with section 71 paragraph 1 no. 8 of the German Stock Corporation Act (Aktiengesetz). The shares shall be repurchased by means of a voluntary public offer addressed to all shareholders which will take place under the direction of SCHNIGGE Wertpapierhandelsbank AG. Overall, up to 1 Million notional no-par value shares of the company shall be repurchased at a purchase price of EUR 0,76 apiece. Further details are provided in the Offer Document which will is accessible and available for download from the website of SCHNIGGE Wertpapierhandelsbank AG (www.schnigge.de). On 26 January 2016 the executive directors of Deufol SE, Hofheim (Germany), have resolved to repurchase up to 1 Million notional no-par value shares of the company on the basis of the authorization issued by the General Meeting of Shareholders on 1 July 2015 to acquire and utilize own shares in accordance with section 71 paragraph 1 no. 8 of the German Stock Corporation Act (Aktiengesetz). Overall, up to 1 Million notional no-par value shares of the company shall be repurchased at a purchase price of EUR 0,48 apiece. Further details are provided in the Offer Document which will be accessible and available for download from the website of SCHNIGGE Wertpapierhandelsbank AG (www.schnigge.de) as of 27 January 2016. The delisting at the German Stock Exchange was decided by the Board of Directors yesterday mainly for cost savings reasons. Furthermore the organization takes care that the shares will continue to be tradable. On the current platform of the German Stock Exchange the shares will be tradable for another 6 weeks. Further actions around the shares are not known to the organization. Deufol SE will of course continue to fulfil their publication requirements. In the first six months of 2015, the Deufol Group realized a positive sales trend. In Germany (incl. the holding) sales increased significantly to € 83.8 million (previous year: € 77.7 million) due to a very positive business trend. However, it should be noted that sales of approx. € 2.1 million are included in this figure for the first time due to changes to the consolidated group. In the Rest of Europe, after scaling back our operation in Tienen, the sales are lower than in the previous year (€ 33.7 million, compared to € 36.5 million), as expected. In the USA / Rest of the World sales increased to € 34.6 million (previous year: € 27.2 million), partly due to favorable exchange rates. The operating result (EBITA) amounted to € 5.0 million in the reporting period (previous year: € 3.0 million) which is an increase by approx. 67%. Especially in Germany and in the USA we are highly satisfied with our earnings trend. Here we have achieved a significant improvement in our earnings following a successful restructuring program and other improvement measures. The income for the period amounts to € 2.6 million, compared to € 0.6 million for the first six months of 2014. In the past fiscal year the net financial liabilities of the Deufol Group – defined as the total financial liabilities less financial receivables and cash – clearly decreased, from € 57.9 million to € 42.3 million. The operating cash flow amounted to € -0.6 million in the period under review and was thus significantly higher than in the previous year (€ -2.3 million). For fiscal year 2015, the Deufol Group plans sales of between € 295 million and € 315 million. Its operating result (EBITDA) should amount to between € 14 and 16 million. In 2014, the Deufol Group realized a negative sales trend on balance, in line with expectations. Due to a very positive business trend in the USA, sales increased in the USA / Rest of the World to € 68.4 million (previous year: € 62.8 million). In Germany (incl. the holding) sales declined slightly more strongly than expected and amounted to € 156.3 million (previous year: € 170.5 million). However, it should be noted that sales of approx. € 5.4 million are no longer included in this figure due to changes to the consolidated group. Moreover, northern and western Germany especially suffered due to a moderate level of demand from some customers. In the Rest of Europe, after scaling back our operation in Tienen the result was lower than in the previous year (€ 74.2 million, compared to € 85.4 million), as expected. In Germany, the northwestern region in particular was affected by several customers’ restraint. Due to the challenging economic environment our operation in Italy was affected by the insolvency of a major customer. On the other hand, in the USA we are highly satisfied with our earnings trend. Here we have achieved a significant improvement in our earnings following a successful restructuring program. The same is true for our activities in China. Overall, the operating result (EBIT) amounted to € 6.2 million in the reporting period (previous year: € 6.0 million). In the past fiscal year the financial liabilities of the Deufol Group clearly decreased, from € 62.8 million to € 58.8 million. Net financial liabilities – defined as the total financial liabilities less financial receivables and cash – decreased even more strongly, by € 13.3 million from € 50.3 million on December 31, 2013 to € 37.0 million at the end of the period under review. This was due to the increase in cash held (+ € 11.0 million) and lower financial receivables (– € 1.6 million). The operating cash flow amounted to € 22.2 million in the period under review and was thus significantly higher than in the previous year (€ 17.2 million). Sales should increase in Germany and in the USA / Rest of the World but fall slightly short of the level realized in the previous year in the Rest of Europe. With regard to our results forecast, we expect our core business in Germany to increase significantly. This is attributable to the productivity-boosting measures implemented last year. For the Rest of Europe we envisage a slight increase in earnings. In the USA / Rest of the World segment, we also expect improved results. Total sales in the first six months of 2014 were at € 141.5 million 8.4 % lower than in the same period in the previous year. Adjusted for changes to the scope of consolidation, the change amounts to – 5.5 %. Also adjusted for the depreciation of the US dollar versus the euro, which averaged 4.3 %, this decline amounts to 4.7 %. The remainder of the change in sales is attributable to the disposal of unprofitable business. The operating result (EBITA) amounted to € 3.0 million and was thus a good 10 % higher than the previous year’s figure of € 2.7 million. The result for the period amounts to € 0.57 million, compared to – € 0.07 million in the first six months of 2013. After deduction of the profit shares for noncontrolling interests (€ 0.04 million), a net profit of € 0.53 million (previous year: – € 0.14 million) is attributable to the shareholders of Deufol SE. Earnings per share in the first six months were € 0.012 (previous year: – € 0.003). In Germany, the existing syndicated loan agreement has been adjusted by means of an amendment. In this respect, improvements were realized in the financial covenants specified in the loan agreement. In addition, the existing financing leeway has been expanded. This includes the grant of options for an extension of the term and an increase in the financing volume. Deufol SE has brought a further action against its former CEO, Andreas Bargende, for the recovery of a sum of € 2.05 million. This reflects the public prosecutor’s investigations into unexplained payments in this amount made by the former managing director of Deufol West GmbH, Manfred Wagner, to Andreas Bargende and a company owned by Bargende and his family. The discovery of these previously unknown facts has also improved the prospects of success in the action for damages which is already pending, with a volume of € 26.9 million. In the second quarter unscheduled one-off costs in the amount of € 0.4 million have resulted in connection with the public prosecutor’s investigations and the action for damages. Deufol SE confirms its planning figures published for fiscal year 2014 in its annual financial report 2013. These envisage sales of between € 290 million and € 310 million and an operating result (EBITDA) of between € 14 million and € 16 million. At € 71.0 million, total sales in the first quarter of 2014 were 7.2 % lower than in the same period in the previous year. Adjusted for changes to the scope of consolidation, the change amounts to – 4.1 %. Also adjusted for the depreciation of the US dollar versus the euro, which averaged 3.7 %, this decline amounts to 3.4 %. In Germany (including the holding company), sales amounted to € 39.7 million (previous year: € 43.3 million). Around € 2.5 million of this decline in the volume of sales is attributable to changes to the scope of consolidation. In the Rest of Europe, Deufol realized sales in the amount of € 18.3 million (previous year: € 20.6 million). In the USA / Rest of the World segment, sales rose to € 13.0 million (previous year: € 12.5 million). Earnings before interest, taxes, depreciation and amortization (EBITDA) were € 2.9 million in the first quarter (previous year: € 2.0 million). Depreciation of tangible assets and amortization of other intangible assets decreased from € 1.9 million to € 1.8 million. The operating result (EBITA) amounted to € 1.1 million and was thus significantly higher than the previous year’s figure of € 0.1 million. The results for the individual segments are not directly comparable with the previous year, due to higher intragroup transfer payments. However, for the purpose of improved comparability the adjusted results are indicated in brackets. The individual segments developed as follows in the first three months of the year: In Germany, EBITA amounts to € 0.6 million (adjusted: € 1.8 million), compared to a figure in the previous year of € 1.7 million. In the Rest of Europe, EBITA amounted to € 0.5 million (adjusted: € 0.7 million), compared to € 0.8 million in the previous year. The USA / Rest of the World segment realized a result of € 0.2 million (adjusted: € 0.3 million), compared to – € 0.8 million in the previous year. The EBITA loss realized by Deufol SE (the holding company) fell to € 0.2 million (adjusted: € 1.7 million), compared to € 1.6 million in the previous year. This was mainly due to higher intragroup transfer payments. The result for the period amounted to – € 0.1 million (previous year: – € 1.2 million). After deduction of the loss shares of noncontrolling interests (€ 0.01 million), there is a net loss of € 0.1 million (previous year: € 1.3 million) attributable to the shareholders of Deufol SE. Earnings per share in the first three months were – € 0.002 (previous year: € 0.029). In the first three months, the cash flow provided by operating activities amounted to – € 2.4 million and was thus higher than the level in the previous year (– € 3.2 million). The financial liabilities of the Deufol Group increased in the first three months of the fiscal year by € 3.4 million to € 66.2 million. As cash and financial receivables simultaneously decreased (– € 2.3 million), the net financial liabilities rose somewhat more strongly, by € 5.7 million from € 50.3 million at the end of the year to € 56.0 million. Deufol SE announces today the final results for the fiscal year 2013 and confirms the preliminary results which have been published on April 17. In a moderate overall economic environment, in the period under review sales from continuing operations amounted to € 318.7 million (previous year: € 333.0 million). We have thus achieved our planning targets, which had envisaged sales in a corridor of between € 310 million and € 325 million. Due to restructuring of the Data Packaging business, revenue in the USA declined to € 62.7 million (previous year: € 71.1 million). In Germany (incl. the holding company), at € 170.5 million the result was also lower than in the previous year (€ 176.0 million). The loss of the Euskirchen location has deprived the Group of sales of a good € 5 million, and a further amount of almost € 3 million is no longer included due to deconsolidated companies. Accordingly, after adjustments this result represents marginal growth. In the Rest of Europe, we were at almost the same level as in the previous year (€ 85.4 million, compared to € 85.9 million). On the results side, in the past year Deufol faced several burdens. In Belgium, one-off expenses amounting to a good € 1.1 million arose in connection with a customer’s relocation of capacities to Eastern Europe and an associated reduction in our operations there. In the USA, the loss of a customer in the gift card segment had a negative impact on income of almost € 1 million, while in China the results of an internal investigation resulted in valuation adjustments in the amount of € 0.9 million. The operating result before goodwill amortization (EBITA) amounted to € 6.0 million in the reporting period (previous year: € 6.2 million). The result for the period was of € 0.5 million (previous year: € 0.1 million). The profit share for noncontrolling interests is € 0.2 million (€ 0.3 million). Earnings attributable to the shareholders of Deufol SE amounted to € 0.3 million in the period under review, compared to – € 0.3 million in the same period in the previous year. Earnings per share were € 0.007 in 2013 (previous year: – € 0.006). The operating cash flow amounted to € 17.2 million in the period under review and was thus higher than in the previous year (€ 16.0 million). In the past fiscal year the financial liabilities of the Deufol Group clearly decreased, from € 70.9 mil-lion to € 62.8 million. Net financial liabilities – defined as the total financial liabilities less financial receivables and cash – decreased less strongly, by € 4.8 million from € 55.0 million on December 31, 2012 to € 50.2 million at the end of the period under review. This was due to the decrease in cash held (– € 2.3 million) and lower financial receivables (– € 1.0. million). For fiscal year 2014 the Deufol Group plans sales in a corridor between € 290 million and € 310 million. Its operating result (EBITDA) will be between € 14 and 16 million. With regard to our results forecast, we expect our core business in the USA to increase. This reflects improvements in our contracts with our Automated Packaging customers which will now be reflected over the course of a full year for the first time. In the Rest of Europe we expect slightly improving results, now that one-off expenses in Belgium are no longer applicable. In Germany, we likewise expect all of our services to report slightly improved results. The Interim Report for the first quarter of 2014 will not be published on May 15, 2014 but on May 22, 2014. Deufol SE announces today the preliminary results for the fiscal year 2013. The complete annual financial statements will not be published on April 24, 2014 but on April 30, 2014. This is accomplished against the background, that the examination by the auditors is not yet concluded. On the basis of provisional, unaudited financial statements the Deufol Group realized sales of € 318.7 million (previous year € 333.0 million). We have thus met our planning target which had envisaged sales in a corridor of between € 310 million and € 325 million. The operating result (EBITDA) came in at € 14.8 million (previous year € 15.0 million) and thus fell slightly below our planning corridor of € 15 million and € 17 million. Deufol SE shares are currently traded under ISIN DE 000A1R1EE6 within the Regulated Market (Prime Standard) of the Frankfurt Stock Exchange. The Administrative Board and the Managing Directors of Deufol SE believe that the Entry Standard of Frankfurt Stock Exchange as a part of the Open Market (Freiverkehr) is the preferable Market Segment for Deufol SE and have therefore decided to initiate a change of notation from the Regulated Market (Prime Standard) to the Entry Standard. The Entry Standard ensures continued efficient trading of Deufol SE shares. The notation in the quality segment Entry Standard ensures that Deufol SE continues to meet high transparency requirements in the future. Deufol intends for the time being to continue publishing quarterly financial reports according to IFRS. In order to change notation from the Regulated Market to the Entry Standard, it is necessary to revoke the existing notation in the Regulated Market of the Frankfurt Stock Exchange and apply for the inclusion of the entire capital in the Entry Standard. The Deufol Group’s cumulative sales amounted to € 238.7 million in the first nine months of 2013. This decline in sales of approx. € 9.8 million or 3.9% on the same period in the previous year overwhelmingly reflects the lower volume of Data Packaging business in the USA, lower sales in Tienen, Belgium, as well as slightly negative tendencies for several export-dependent sectors in Germany, in line with the economic trend. Growth in many areas has offset the adverse effects of Data Packaging in the USA and the Belgian automotive sector, but has not been able to fully make up for this. The trend has stabilized in the USA and Belgium which are now providing solid contributions, albeit at a lower level than in the previous year. In the USA/Rest of the World segment, sales were 12 % lower than in the previous year, at € 45.3 million. In contrast, in Germany sales were at € 130.5 million a good 3% lower than in the previous year, while in the Rest of Europe at € 62.9 million sales were almost 1% higher than in the previous year. The operating result (EBIT) after nine months of the year amounts to € 5.3 million (previous year: € 6.0 million). The individual segments developed as follows in the first nine months of the year: In Germa-ny, the EBITA amounted to € 4.5 million. Due to several customers’ restraint in the export-dependent mechanical engineering sector, this was € 1.3 million lower than in the previous year. In the Rest of Europe, EBITA fell from € 4.0 million to € 3.1 million. This was mainly due to the lower results for our Belgian location in Tienen. However, the decrease here was partly made up for through improved results in other countries. The USA/Rest of the World segment realized a result of € 0.5 million (previous year: € 1.8 million). Data Packaging suffered here due to the consolidation trend in the data packaging sector at the start of the year. The other sectors have now stabilized in terms of their earnings and have performed well, thus somewhat compensating for Data Packaging’s lower operating result. The EBITA loss of Deufol SE (the holding company) declined sharply, to € 3.0 million, compared to € 5.5 million in the previous year. Earnings before taxes (EBT) in the first nine months of the year were € 2.91 million (previous year: € 3.55 million). After income tax expenses (€ 1.75 million), income from continuing operations is € 1.16 million, compared to € 1.66 million in the first nine months of 2012. The result for the period also amounted to € 1.16 million (previous year: € 1.38 million). After deduction of the profit shares of noncontrolling interests (€ 0.14 million), a net profit of € 1.02 million (previous year: € 1.01 million) is attributable to the shareholders of Deufol SE. Earnings per share in the first nine months were € 0.023 (previous year: € 0.023). In the first nine months, the cash flow provided by operating activities amounted to € 12.1 million and was thus higher than the level in the previous year (€ 10.3 million). The financial liabilities of the Deufol Group decreased in the first nine months of the fiscal year by € 6.3 million to € 64.7 million. As cash and financial receivables both decreased (− € 1.8 million), net financial liabilities declined at a slightly lower rate, from € 55.0 million at the end of the year to the current € 50.5 million. Despite encouraging progress in transforming the Company to place it on a sustainable footing – in an environment characterized by restraint in the mechanical engineering sector – we have been unable to make up for the challenging start to the year and are accordingly revising our target earnings for fiscal year 2013. We now expect an operating result (EBITDA) of between € 15 million and € 17 million (previously, € 18 million to € 20 million). For our sales, we confirm our planning figures in a corridor between € 310 million and € 325 million. In a favorable second quarter, sales amounted to € 78.0 million (– 0.7 % on the same quarter in the previous year). In Germany (including the holding company), sales increased by 3.3 % to € 44.6 million by comparison with the same quarter in the previous year. In the Rest of Europe sales also rose, by 0.8 % to € 20.6 million. Only in the USA / Rest of the World were sales € 12.7 million or 14.5 % lower than in the previous year, due to the restructuring of the Data Packaging business. Excluding the negative effect resulting from Data Packaging business, sales in the USA improved by 20 %. At € 154.4 million, cumulative sales in the first six months of 2013 were 2.2 % lower than in the same period in the previous year. In Germany, at € 86.7 million, sales were 2.7 % lower than in the previous year. In the Rest of Europe, sales rose by 1.9 % to € 41.2 million. In the USA / Rest of the World, sales were 10.7 % lower than in the previous year, at € 25.3 million. The second-quarter operating result (EBITA) amounted to € 2.7 million (previous year: € 1.1 million). The EBITA thus more than doubled, making up significant ground following a slow start to the year. The individual segments performed as follows in the second quarter: In Germany, EBITA rose to € 2.0 million, following € 1.4 million in the previous year. The Rest of Europe realized an almost unchanged EBITA of € 1.3 million (previous year: € 1.4 million). The declining results at our Belgian location in Tienen were almost entirely compensated for through the rising profits in other European countries. The USA / Rest of the World segment realized a result of € 0.04 million (previous year: € 0.5 million). Data Packaging continued to suffer here following the cancellation of orders from a major client. The EBITA loss of Deufol SE (Holding) amounted to € 0.6 million, a significant decrease on the previous year. Following the strong second quarter, the operating result (EBIT) in the first half year is now higher than in the previous year (€ 2.7 million, compared to € 2.5 million in the previous year). The individual segments developed as follows in the first six months of the year: In Germany, the modest first quarter was almost made up for over the first half year as a whole. EBITA amounted to € 3.7 million (previous year: € 3.9 million). In the Rest of Europe EBITA fell slightly, from € 2.4 million to € 2.1 million. This was mainly due to lower results for our Belgian location in Tienen. The USA / Rest of the World segment realized a result of – € 0.8 million (previous year: + € 0.2 million). Data Packaging suffered here following the cancellation of orders from a major client. The EBITA loss of Deufol SE (the holding company) declined sharply, to € 2.2 million, compared to € 3.9 million in the previous year. Earnings before taxes (EBT) in the first six months of the year were € 1.1 million (previous year: € 0.8 million). After income tax expenses (€ 1.2 million), income from continuing operations is almost balanced, at – € 0.08 million, compared to – € 0.66 million in the first six months of 2012. The result for the period also amounted to – € 0.08 million (previous year: – € 0.95 million). After deduction of the profit shares of noncontrolling interests (€ 0.07 million), there is a net loss of € 0.14 million (previous year: loss of € 1.2 million) attributable to the shareholders of Deufol SE. Earnings per share in the first six months were – € 0.003 (previous year: – € 0.026). In the first six months, the cash flow provided by operating activities amounted to € 7.2 million and was thus significantly higher than the level in the previous year (€ 5.7 million). The financial liabilities of the Deufol Group decreased in the first six months of the fiscal year by € 2.2 million to € 68.7 million. Since cash and financial receivables remained unchanged, net financial liabilities fell to the same extent, from € 55.0 million at the end of the year to the current € 52.8 million. Deufol SE confirms its planning figures published for fiscal year 2013 in its annual financial report. These envisage sales of between € 310 million and € 325 million and an operating result (EBITDA) of between € 18 million and € 20 million. At € 76.4 million, total sales in the first quarter of 2013 were 3.7 % lower than in the same period in the previous year. Adjusted for the slight depreciation of the US dollar versus the euro which averaged 0.7 %, this decline amounts to 3.6 %. In Germany (including the holding company), sales were at € 43.3 million 5.9 % lower than in the same quarter in the previous year. Around two-thirds of the de-cline in sales is attributable to the closure of the Euskirchen location. In the Rest of Europe, sales rose by 3.1 % to € 20.6 million. In the USA/Rest of the World, sales were 6.5 % lower than in the previous year, at € 12.5 million. Earnings before interest, taxes, depreciation and amortization (EBITDA) were € 2.0 million in the first quarter (previous year: € 3.7 million). Depreciation of tangible assets and amortization of other intangible assets decreased from € 2.2 million to € 1.9 million. The operating result (EBITA) amounted to € 0.1 million and was thus lower than the previous year’s figure of € 1.4 million. This result includes one-off expenses in the amount of € 0.5 million in connec-tion with the € 26 million action for damages versus former managers of the company. In the same quarter in the previous year, these expenses totaled € 1.10 million and were mainly incurred by the holding company. The individual segments developed as follows in the first three months of the year: In Germany, EBITA amounts to € 1.7 million (previous year: € 2.5 million). The lower results are mainly attributable to a lower volume of business at two key locations. Customer business has picked up more slowly here than in the previous year. In addition, the moderate economic trend and the tough winter have curbed business development in the first quarter. This has particularly affected our outdoor packaging activities. In the Rest of Europe, EBITA fell from € 1.0 million to € 0.8 million. This was mainly due to lower results for our Belgian location in Tienen. The USA/Rest of the World segment realized a result of – € 0.8 million (previous year: – € 0.3 million). Data Packaging suffered here following the cancellation of orders from a major client. The EBITA loss of Deufol SE (the holding company) was € 1.6 million, compared to € 1.7 million in the previous year. The result for the period amounted to – € 1.2 million (previous year: € 0.2 million). After deduction of the profit shares of noncontrolling interests (€ 0.2 million), there is a net loss of € 1.3 million (previous year: profit of € 0.1 million) attributable to the shareholders of Deufol SE. Earnings per share in the first three months were – € 0.029 (previous year: € 0.002). In the first three months, the cash flow provided by operating activities amounted to – € 3.2 million and was thus lower than the level in the previous year (€ 5.7 million). This decrease is mainly attributable to the € 7.3 million decrease in trade payables in the first quarter of 2013. The financial liabilities of the Deufol Group increased in the first three months of the fiscal year by € 4.5 million to € 75.4 million. As cash and financial receivables simultaneously decreased (– € 1.1 million), the net financial liabilities rose somewhat more strongly, by € 5.6 million from € 55.0 million at the end of the year to € 60.6 million. Deufol SE announced today the final results for the fiscal year 2012. They are identical with the preliminary results which have been published on April 18. With respect to the results, please refer to the Ad-hoc release dated April 18, 2013 which is available on our Website at www.deufol.com. Deufol SE announces today the preliminary results for the fiscal year 2012. The complete annual fi-nancial statements will be published on April 24. In 2012 the Deufol Group realized a positive sales trend which was mainly driven by the American market, where sales rose by 30.4 % to € 71.1 million. In the Rest of Europe we were at almost the same level as in the previous year (€ 85.9 million, compared to € 87.0 million) while in Germany at € 175.7 million we were slightly higher than in the previous year (€ 173.2 million). Overall in the reporting period sales from continuing operations increased by 5.7 % on the previous year to € 333.0 million. We have thus slightly exceeded our planning targets, which had envisaged sales in a corridor of between € 315 million and € 330 million. Adjusted for the US dollar’s appreciation against the Euro of around 7.7 % on average, this represents adjusted growth of 3.9 %. The figures were negatively affected by one-off expenses associated with the action for damages versus former managers of the Company. In this connection, one-off expenses of € 3.9 million have arisen at the level of the holding company for investigations, court proceedings and reorganization. The expenses associated with the launch of a European stock corporation (SE) and the registered shares are a small proportion of this amount. The comparative operating result is at € 10.1 million approx. € 0.5 million higher than in the previous year. The unadjusted operating result before goodwill amortization (EBITA) fell in the reporting period from € 10.7 million to € 6.2 million. Adjusted for the one-off expenses (€ 3.9 million) it amounted to € 10.1 million. Allowing for the one-off items in 2011 amounting to € 1.1 million (€ 0.8 million release of liabilities to employees, € 0.8 million income from a legal dispute, –€ 0.5 million action related costs), the comparative operating basis amounts to € 9.6 million. The unadjusted earnings before taxes (EBT) in the past year were € 2.8 million (previous year: € 7.4 million). After income tax expenses (€ 2.4 million), the income from continuing operations is € 0.4 million (previous year € 3.9 million). The discontinued operation “Carton Business” in the USA led to a loss of € 0.34 million (previous year: – € 3.3 million). This means a result for the period of € 0.1 million (previous year: € 0.6 million). The profit share for noncontrolling interests is € 0.3 million (previous year € 0.5 million). Earnings attributable to the shareholders of Deufol SE amounted to – € 0.5 million in the period under review, compared to € 0.1 million in the same period in the previous year. Earnings per share were – € 0.006 in 2012 (previous year € 0.002). At € 175.7 million, consolidated sales in Germany in 2012 slightly exceeded sales in the previous year which amounted to € 173.2 million. EBITA in this sector increased by 39.5 % from € 5.4 million to € 7.5 million. The EBITA margin rose from 3.1 % to 4.3 %. This increase is primarily attributable to stronger results for “Export & Industrial Packaging”. This reflects initial success for the reorganization and integration measures as well as the central purchasing system which has now been established. In the Rest of Europe we realized consolidated sales of € 85.9 million, which is only slightly lower than in the previous year (€ 87.0 million). However, this sales trend was unevenly distributed among the Group’s regions, with + 0.3 % in Belgium, – 13.1 % in Italy and + 10.4 % in the Slovakia / Czech Re-public / Austria region. In the past year, the operating result (EBITA) fell from € 7.4 million to € 4.3 million. This decrease is primarily due to lower results in Belgium. In 2011 this included one-off items (release of liabilities to employees and income from a legal dispute, each of which amounted to € 0.8 million). We also realized lower volumes at our Belgian automotive location. In Italy, the figures were slightly lower than in the previous year (as expected), while the Slovakia / Czech Republic / Austria region reported significantly improved results. In the USA / Rest of the World segment, consolidated sales were at € 71.1 million 30.4 % higher than in the previous year. This is mainly attributable to higher volumes in Data Packaging. Sales realized from the operations in Charlotte and Suzhou have increased by more than two-thirds but are still in the low single-digit million range. Adjusting sales by segment by 7.7 % on average – to allow for the US dollar’s appreciation against the euro – the increase amounted to 20.5 %. EBITA in this segment amounted to € 0.4 million, compared to € 1.1 million in the previous year. Our subsidiaries Deufol Packaging (Suzhou) Co., Ltd. and Deufol Charlotte LLC both recorded small losses. Our newly established subsidiary in Singapore (Deufol Singapore PTE. LTD.) was included in the scope of consolidation for the first time, but did not yet have any operating business. The operating cash flow amounted to € 16.0 million in the period under review and was thus significantly higher than in the previous year (€ 4.6 million). This rise is predominantly due to the € 5.1 million decrease in trade receivables. In the previous year, trade receivables increased by € 10.8 million while decreasing cash flow. In addition, the loss resulting from the discontinued operation was around € 3.0 million lower. In the past fiscal year the financial liabilities of the Deufol Group clearly decreased, from € 79.6 million to € 70.9 million. Net financial liabilities – defined as the total financial liabilities less financial receivables and cash – decreased less strongly, by € 2.9 million from € 57.9 million on December 31, 2011 to € 55.0 million at the end of the period under review. This was due to the decrease in cash held (– € 4.1 million) and lower financial receivables (– € 1.7 million). * The adjusted EBIT for 2012 is adjusted for one-off expenses (€ 3.9 million) and in 2011 for one-off effects of € 1.1 million (€ 0.8 million release of liabilities to employees, € 0.8 million income from a legal dispute, –€ 0.5 million action related costs). In regard to the sales trend, we expect to see a significant decrease in the USA, where a major customer has cancelled its orders. Accordingly, we have immediately adjusted our personnel capacities. Alongside this release of production capacities, we have launched extensive and promising business development activities to acquire new customers and new business. In Germany we envisage an improvement, while in the Rest of Europe we expect a slight fall in sales. At our automotive location in Belgium, our customer is planning to gradually handle some aspects of this service itself. With regard to our results forecast, we expect our core business in the US to improve. The background is an improved contract situation with our customer in the automated packaging. From our present point of view, however, we cannot rule out, that in connection with the rescaling of the data packaging business there will be some depreciation of fixed assets. For the Rest of Europe we envis-age slightly falling results. In Germany, we expect all of our services to report significantly improved results. For the fiscal year 2013 the Deufol Group envisages sales in a corridor between € 310 million and € 325 million. Its operating result (EBITDA) is expected between € 18 million and € 20 million. For 2014, if the economic recovery continues we expect to see a positive sales and income trend. In a strong third quarter, sales amounted to € 90.5 million. This represents growth of 13.5 % on the same period in the previous year. The sales boost which was already apparent in the first half-year (3.9 %) has thus picked up. Cumulative sales in the first nine months of 2012 were at € 248.5 million significantly higher (7.2 %) than in the same period in the previous year. In Germany, at € 134.4 million, sales were 4.2 % higher than in the previous year. In the Rest of Europe, sales declined by 4.2 % to € 62.3 million. In the USA / Rest of the World, sales were significantly higher than in the previous year, at € 51.5 million, a rise of 37.0 %. The third-quarter operating result (EBITA) amounted to € 3.5 million (previous year: € 2.8 million). This corresponds to an improvement of 25.4 %. Third-quarter EBITA net of one-off expenses of € 0.5 million amounted to € 4.0 million, an increase of 42.8 %. These one-off expenses were almost entirely associated with the € 26 million action for damages against former managers of the Company. This also includes the costs associated with the launch of a European stock corporation (SE) and the registered shares. EBITA net of cumulative one-off expenses of € 3.14 million amounted to € 9.17 million and thus clear-ly exceeded the figure for the previous year of € 7.88 million. The unadjusted EBITA for the first nine months of 2012 was € 6.03 million. Including a one-off effect in Belgium in the second quarter of 2011 (release of liabilities to employees in the amount of € 0.78 million), the comparative operating basis amounted to € 7.10 million. Hence, the comparative operating result is around 29 % higher than in the previous year. The individual segments developed as follows in the first nine months of the year: In Germany, we recorded a welcome increase in EBITA from € 3.84 million to € 5.80 million. This development reflects initial success for the reorganization and integration measures launched by the Company. In the Rest of Europe, EBITA declined by 24.8 % to € 4.02 million, mainly due to the winding-down of the one-off effect in Belgium (see above). The USA / Rest of the World segment realized a result of € 1.75 million (previous year: € 0.57 million). The expansion of capacity in Data Packaging is now bearing fruits here. The EBITA loss of Deufol AG (Holding) – which accounted for most of the one-off expenses – was € 5.53 million (previous year: € 1.85 million) as a consequence of these one-off expenses. * The adjusted EBITA for 2012 is adjusted for one-off expenses (€ 3.14 million) and in 2011 for the release of liabilities to employees in Belgium (€ 0.78 million). Unadjusted earnings before taxes (EBT) in the first nine months of the year were € 3.55 million (previ-ous year: € 5.12 million). After income tax expenses (€ 1.893 million), the result from continuing operations is € 1.66 million, compared to € 3.13 million in the first nine months of 2011. The discontinued operation “Carton Business” in the USA led to a loss of € 0.28 million (previous year: – € 0.47 million). The loss consists of a current loss of € 0.03 million and the final measurement of the pension commitment (– € 0.25 million). This means a result for the period of € 1.38 million (previous year: € 2.66 million). After deduction of the profit shares of noncontrolling interests (€ 0.36 million), a net profit of € 1.01 million (previous year: profit of € 2.24 million) is attributable to the shareholders of Deufol AG. Earn-ings per share in the first nine months were € 0.023 (previous year: € 0.051). In the first nine months, the cash flow provided by operating activities amounted to € 10.3 million and was thus significantly higher than the level in the previous year (€ 4.53 million). The financial liabilities of the Deufol Group decreased in the first nine months of the fiscal year by € 0.3 million to € 79.3 million. As cash and financial receivables simultaneously decreased slightly (– € 0.1 million), the net financial liabilities fell slightly less strongly, by € 0.2 million, from € 57.9 mil-lion at the end of the year to € 57.7 million. *The presentation for the first six months 2011 is adjusted for the effect of the discontinued operation, this means all income and expenses for this operation are reported separately in the income statement under “Loss from discontin-ued operation (net of tax)”. ** The adjusted EBITA for 2012 is adjusted for one-off expenses (€ 0.49 million in Q3 and € 3.14 million in the first nine months) and in 2011 for the release of liabilities to employees in Belgium (€ 0.78 million). The planning for the 2012 fiscal year anticipated sales of between € 315 million and € 330 million and an operating result (EBITA) between € 12 million and € 14 million. Deufol AG now expects a volume of sales at the upper end of this range and expects EBITA adjusted for one-off expenses to fall within the forecast range. One-off expenses of up to € 4.5 million are currently expected for this year. Total sales in the first six months of 2012 were at € 158.0 million 3.9 % higher than in the same period in the previous year. Adjusted for the 10 % average appreciation of the US dollar versus the euro, this growth amounts to 2.0 %. With a 56.4 % share of Group sales, the proportion accounted for by Germany remained stable compared to the previous year. The share of sales realized elsewhere in Europe decreased, from 28.4 % to 25.6 %, and the USA’s share of sales fell by 2.6 percentage points to 17.9 %. The operating result (EBITA) adjusted by one-off expenses amounted to € 5.16 million and thus exceeded the previous year’s figure of € 5.07 million. One-off expenses of € 2.65 million arose predominantly in connection with the € 26 million action for damages against former managers of the company. But included are also costs associated with the conversion into a European public limited company (SE) and for the introduction of registered shares. In the first half of 2012, the unadjusted EBITA amounted to € 2.51 million. Including a one-off effect in Belgium in the second quarter of 2011 (release of liabilities to employees in the amount of € 0.78 million), the comparative operating basis amounted to € 4.29 million. Hence, the comparative operating result is around 20.3 % above the previous year. The individual segments performed as follows in the first six months: In Germany we recorded a wel-come increase in EBITA from € 2.67 million to € 3.89 million. This development reflects initial success for the reorganization and integration measures launched by the company. In the Rest of Europe, EBITA declined by 34.1 % to € 2.36 million, mainly due to the discontinuance of the one-off effect in Belgium (see above). The USA / Rest of the World segment realized a result of € 0.16 million (previ-ous year: € 0.18 million). This reflected expenses associated with the expansion of capacity in the Data Packaging division. The EBITA loss of Deufol AG (Holding), were most of the one-off expenses occurred, was € 3.87 million (previous year: € 1.35 million) as a consequence of the one-off expenses. * The adjusted EBITA for 2012 is adjusted for one-off expenses (€ 1.55 million in Q2 and € 2.65 million in the first half year) and in 2011 for the release of liabilities to employees in Belgium (€ 0.78 million). After deduction of the profit shares of noncontrolling interests (€ 0.21 million), there is a net loss of € 1.16 million (previous year: profit of € 1.02 million) attributable to the shareholders of Deufol AG. Earnings per share in the first six months were – € 0.028 (previous year: € 0.023). In the first six months, the cash flow provided by operating activities amounted to € 5.67 million and was thus significantly higher than the level in the previous year (€ 4.37 million). The financial liabilities of the Deufol Group decreased in the first six months of the fiscal year by € 0.8 million to € 78.8 million. As cash and financial receivables simultaneously decreased (– € 2.1 million), the net financial liabilities rose by € 1.3 million, from € 57.9 million at the end of the year to € 59.2 million. ** The adjusted EBITA for 2012 is adjusted for one-off expenses (€ 1.55 million in Q2 and € 2.65 million in the first half year) and in 2011 for the release of liabilities to employees in Belgium (€ 0.78 million). The plan for the 2012 fiscal year anticipated sales between € 315 million and € 330 million and an operating result (EBITA) between € 12 million and € 14 million. Deufol AG has confirmed the plan in terms of sales and expects EBITA adjusted by one-off expenses to be in the forecast range. One-off expenses of up to € 4.5 million are expected for this year. Further, management expects that Deufol share trading will return to normal after the introduction of registered shares. The Management Board and the Supervisory Board of Deufol AG, Hofheim, filed on April 4, 2012, a criminal complaint with the district attorney of Frankfurt am Main, Germany, against the former managing director of its subsidiary Deufol Tailleur GmbH, Manfred Wagner, against Deufol AG’s former chairman of the board, Andreas Bargende, two other people from his personal circle, as well as against the former general counsel of the company, Wolfgang Gluecks. The district attorney in Frankfurt am Main has commenced investigative proceedings (file number 7210 Js 216358/12). Deufol AG now expands the criminal complaint to the former managers of the Group Mark Agatz, Frank Jovanovic und Jost Hahnebeck. It is suspected that the aforementioned persons engaged in actions detrimental to the Deufol Group during the course of business from 2006 through 2011. Beside the criminal complaint Deufol AG is filing civil claims for the damages it is entitled to. Today, it filed civil claims with the district court of Frankfurt am Main against the former Deufol managers Andreas Bargende, Manfred Artur Wagner, Tammo Fey, Wolfgang Glücks, Mark Agatz, Frank Jovanovic, Jost Hahnebeck, and four other people from the personal circle of Andreas Bargende. Damages presently amount to Euro 26.4 million, which will be pursued by judicial process against the above mentioned persons in different amounts. The company is confident it can enforce its claims for damages. In the first quarter of 2012, at € 79.4 million sales were 5.7 % higher than in the same period in the previous year. Adjusted for the 4.1 % average appreciation of the US dollar versus the euro, this growth amounts to 5.0 %. In Germany, sales rose by 8.1 % on the same quarter in the previous year, to € 46.0 million. In the Rest of Europe, sales fell by 5.9 % to € 20.6 million. In the USA / Rest of the world, sales were significantly higher than in the previous year, at € 13.2 million, a rise of 16.9 %. Adjusted for the costs of the Company’s internal investigations the EBITA amounted to € 2.54 million, compared and thus was around 39 % higher to the previous year. This reflects initial success of the measures taken in the last months (e.g. establishing a central purchasing system). The unadjusted operating result (EBITA) in the first quarter was at € 1.44 million 21.6 % lower than the level for the same period in the previous year (€ 1.83 million). The result is attributable to one-off ex-penses incurred by Deufol AG (holding) which also burdened the other earnings indicators. The individual segments performed as follows: In Germany, EBITA showed a pleasant increase from € 1.36 million to € 2.53 million. Particularly here the structural measures bear fruit. In the Rest of Eu-rope, EBITA fell by 19.5 % to € 1.02 million. The USA / Rest of the World segment realized an operat-ing loss of € 0.33 million (previous year: – € 0.26 million). This reflected expenses associated with the expansion of capacity in the Data Packaging division, which led to a scheduled temporary decrease in the operating result. Due to the special item, the EBITA loss of Deufol AG (Holding) amounted to € 1.73 million compared to € 0.58 million before. Unadjusted earnings before taxes (EBT) amounted to € 0.81 million in the first quarter (previous year: € 0.92 million). After tax expenses (€ 0.65 million), the income from continuing operations amounts to € 0.17 million, compared to € 0.39 million in the first quarter of 2011. The discontinued operation “Carton Business” in the USA yielded a small loss of € 14 thousand (pre-vious year: € 161 thousand). This corresponds to a result for the period of € 0.15 million (previous year: + € 0.23 million). After deduction of the profit shares of noncontrolling interests (€ 0.08 million), a net profit of € 0.08 million is attributable to the shareholders of Deufol AG, compared € 0.12 million in the previous year. Earnings per share in the first quarter were € 0.002 (previous year: € 0.003). The first-quarter cash flow provided by operating activities amounted to € 5.73 million and was thus significantly higher than the level in the previous year (€ 2.46 million). The financial indebtedness of the Deufol Group decreased in the first three months of the fiscal year by € 1.8 million to € 77.8 million. Since cash and financial receivables simultaneously declined (– € 0.5 million), net financial liabilities also fell (though slightly less strongly), by € 1.3 million, from € 57.9 million at the end of the year to € 56.6 million. Deufol AG confirms its planning figures published for fiscal year 2012 in its annual financial report. These envisage sales in a corridor between € 315 million and € 330 million and an operating result (EBITA) of between € 12 million and € 14 million. It has appropriately been brought to our attention that a contradiction between the information on page 122 of the Annual Report 2011 (Events after the balance sheet date: business dealings to the detriment of Deufol Group) and the information on page 125 (Relationships with related parties) might be perceivable. Hence, we would like to clarify, based on third party appraiser options, that there is reason to believe that the transactions with Manfred Wagner which are described on page 125 are doubtful with regard to their arm’s length nature. These transactions are subject of the criminal proceedings and the compensation claims which are described on page 125. Today, the Managing Board of Deufol AG resolved with the approval of the Supervisory Board to transform the company into a European public limited company (Societas Europaea, SE). The change in legal form is still subject to the approval of the Annual General Meeting, which is to be held in Hofheim on July 4th, 2012. Due to the transformation into an SE, the existing shareholders of Deufol AG will automatically become shareholders of Deufol AG SE; the rights of shareholders remain unaffected. Nor is the change in legal form expected to have any implications for clients and employees of Deufol Group. In the course of the legal change, Deufol plans to convert its two-tier management structure consisting of the Managing Board and the Supervisory Board to the internationally common one tier system with an Administrative Board. The intended transformation into an SE reflects the increasingly international character both of Deufol's business activities and its workforce. At the same time the Managing Board and The Supervisory Board resolved to propose the conversion of all bearer shares into registered shares at the Company's Annual Shareholders' Meeting. Registered shares enable improved, direct contact between a public limited company and its shareholders. We are able to get in contact with our registered shareholders in a more targeted manner and inform them immediately and directly about developments within our company. The Managing Board and Supervisory Board of Deufol AG also today resolved to propose a dividend of 3 euro cent per share for fiscal 2011. Deufol AG today published its annual accounts for the year 2011 and looks back on a challenging fiscal year 2011 full of changes. In terms of public perception, the turnover of personnel at the level of the Company’s management is certainly one of the most significant of these changes. This change was made due to the discovery of a breach of trust on the part of high-ranking executives who did not always act in the shareholders’ interests. However, new personnel have now been appointed to these management positions. In the organizational field, in 2011 we made further progress toward creating a uniform profile throughout the Group. The strengthening of our headquarters in Hofheim (Wallau) as a central management unit, the integration of our industrial goods packaging locations in the overall Group and the strategic development of a central purchasing system as one of our responses to fluctuating wood prices were important steps. As a further measure in the context of change the board is concretely assessing the transformation of Deufol AG into a Societas Europaea (SE) as well as converting bearer shares to registered shares. In an economic environment showing a positive overall trend, in the reporting period sales from continuing operations increased by 4.0 % on the previous year to € 315.2 million. We have thus achieved our planning targets, which had envisaged sales in a corridor of between € 310 million and € 325 million. If the sales trend is adjusted for the acquisitions, this shows organic growth of 2.8 %. If one also takes into consideration the US dollar’s depreciation against the euro of around 5 % on average, this represents adjusted growth of 3.6 %. On the results side, in Germany Export & Industrial Packaging suffered due to rising wood prices and thus recorded lower results. In the USA, the volumes provided by battery packaging were lower, so that the expected results were not achieved. In the Rest of Europe, our Italian subsidiary and our Belgian companies exceeded expectations. In overall terms, the operating result from continuing operations was at € 10.7 million lower than the adjusted figure for the previous year (€ 11.9 million). Earnings before taxes amounted to € 7.4 million in the past year and were thus slightly below the level in 2010 (€ 7.5 million). After income tax expenses (€ 3.50 million) the income from continuing operations is € 3.9 million (previous year: € 4.5 million). The discontinued operation “Carton Business” in the USA led to a loss of € 3.3 million (previous year: – € 1.2 million). This consists of a current loss of € 0.8 million and a pension liability of € 2.5 million. This means a result for the period of € 0.6 million (previous year: € 3.3 million). The profit share for noncontrolling interests is € 0.5 million (€ 0.4 million). Earnings attributable to the shareholders of Deufol AG amounted to € 0.1 million in the period under review, compared to € 2.9 million in the same period in the previous year. Earnings per share were € 0.002 in 2011 (previous year: € 0.067). In the invitation to the Annual General Meeting, the Executive and Supervisory Boards will propose the appropriation of the net income (calculated according to German Commercial Code principles) of Deufol AG for the fiscal year 2011 in the amount of € 9.4 million. In late October, the Deufol Group reorganized its financing structures in Germany. The Group has entered into a loan facility with a consortium of banks, with an initial volume of € 45 million. This credit facility has a term of four years and includes an option for a one-year extension. This was almost entirely used for the repayment of existing loans but also increased the Group’s credit facility by approx. € 10 million. This financing safeguards medium-term liquidity requirements and provides scope for growth for the Group. In the past fiscal year, the financial liabilities of the Deufol Group increased slightly, from € 78.2 million to € 79.6 million. The operating cash flow amounted to € 4.6 million in the period under review and was thus significantly lower than in the previous year (€ 19.9 million). This decline is predominantly due to the cut-off date-related € 10.9 million increase in trade receivables. In the previous year, trade receivables decreased by € 6.4 million while increasing cash flow. At € 173.2 million, consolidated sales in Germany in 2011 exceeded sales in the previous year by 7.7 %. EBITA in this sector decreased from € 7.3 million to € 5.4 million. The profit has mainly been influenced by increased commodity prices (wood) which led to additional expenditure. However, the continued slight easing of wood prices in the fourth quarter and the increasing factoring-in of the commodities price trend in our customer relationships give cause for optimism. In the Rest of Europe, we achieved consolidated sales of € 87.0 million, an increase of 2.2 % on the previous year. The operating result (EBITA) rose in the past year by 49.2 % from € 5.0 million to € 7.4 million. This increase is primarily due to improved results in Belgium. Favorable operating business was a factor in this country, which also benefited from the release of a liability to employees and from income from a legal dispute in the amount of € 0.8 million. In Italy, results also went up despite the € 0.4 million start-up losses associated with the new Roverbella site. In the USA / Rest of the World segment, consolidated sales – adjusted for the discontinued “Carton Business” – were at € 54.5 million 3.8 % lower than in the previous year. This was mainly due to lower battery packaging volumes, which increases in Data Packaging were unable to compensate for. The new operations in Charlotte and Suzhou contributed sales volumes in the low single-digit million range. EBITA in this segment amounted to € 1.1 million, compared to € 2.1 million in the previous year. This was due to the lower rate of utilization of production capacities due to lower volumes in the packaging business and the associated decrease in the operating result. In view of a weaker economic environment for the fiscal year 2012, the Deufol Group plans sales in a corridor between € 315 million and € 330 million. The operating result (EBITA) should amount to between € 12 million and € 14 million. With regard to the sales trend, we predict a clear increase in the USA, driven by the growth of Data Packaging. In Germany and the Rest of Europe, we predict stable or slightly falling sales. In terms of our results forecast, we predict a significant improvement in business in the USA. In line with our sales planning, this will mainly be provided by our Data Packaging division. In Germany, we expect all of our services to report significantly improved results. For the Rest of Europe, we envisage stable or slightly falling operating results. Today, the Management Board and the Supervisory Board of Deufol AG, Hofheim, filed a criminal complaint with the district attorney of Frankfurt am Main, Germany, against the former managing director of its subsidiary Deufol Tailleur GmbH, Manfred Wagner, against Deufol AG’s former chairman of the board, Andreas Bargende, two other people from his personal circle, as well as against the former general counsel of the company, Wolfgang Gluecks. The district attorney in Frankfurt am Main has now commenced investigative proceedings. Deufol AG had already separated from the aforementioned persons at the end of 2011. Damages presently amount to low two-digit millions of Euros. In addition to the criminal proceedings having been commenced, Deufol AG shall be filing civil claims for the damages it is entitled to. The company is confident it can enforce its claims for damages. By resolution of the Supervisory Board dated November 28, 2011 CEO Andreas Bargende will leave the company with immediate effect. The board members Detlef Hübner and Dr. Tillmann Blaschke will be assigned the departments Business Development, Communications, Compliance and Legal which Mr Bargende recently held. In addition to Operations and Purchasing, his current area of responsibility, Detlef Hübner will take over Business Development. Adding to his current commercial functions in the areas HR, IT, Real Estate and Investor Relations Dr. Tillmann Blaschke will take over the responsibility for Communications, Compliance and Legal. On November 10, 2011 the company had already announced that Dr. Blaschke will take over the position as Chief Financial Officer as per the end of the year. In the frame of the rearrangement of the management's responsibilities such duties will now be transferred to Dr. Blaschke with immediate effect. Going forward the company will now be managed jointly by Detlef Hübner and Dr. Tillmann Blaschke. At the same time, the process of strengthening the second managerial level in the company will be continued. “The above-mentioned changes symbolize the continuation of the path already taken this summer into an era of renewal”, say Hübner and Dr. Blaschke in agreement. The Chairman of the Supervisory Board Mr. Georg Melzer has today resigned from his function as a member and Chairman of the Supervisory Board for personal reasons. The resignation took place in agreement with the Executive Board. The Executive Board and the other members of the Supervisory Board expressed their gratitude to Mr. Melzer for their dedicated and constructive collaboration. Mr. Wulf Matthias, who was elected as a replacement member in the last Annual General Meeting, succeeds Mr. Melzer as member of the Supervisory Board. Total sales in the third quarter of 2011 were at € 80.2 million 1.7 % higher than in the same period in the previous year. Adjusted for changes due to acquisitions, this represents organic growth of 0.3 %. In Germa-ny sales rose to € 43.3 million, an increase of 6.1 % on the same quarter in the previous year, and in the rest of Europe they rose to € 21.9 million (+ 1.9 %). In the USA, at € 14.9 million sales were 9.2 % lower than in the previous year. Total sales in the first nine months of 2011 were at € 233.3 million 3.6 % higher than in the same period in the previous year. Adjusted for acquisitions, this represents organic growth of 2.5 %. If one also takes into consideration the US dollar’s depreciation against the euro of 6.9 % on average, the increase amounts to 3.7 %. At € 2.8 million, the operating result (EBITA) in the third quarter was lower than in the same period in the previous year (€ 3.2 million). The individual segments performed as follows: In Germany we recorded an EBITA € 1.2 million compared to € 1.8 million previous year (– 36.7 %). In the rest of Europe EBITA increased from € 1.2 million to € 1.8 million (+ 45.2 %). The USA / Rest of the World segment realized an operating result of € 0.4 million compared to € 0.7 million previous year (– 46.5 %). At € 7.4 million, EBITA in the first nine months of 2011 was 11.5% below the level for the same period in the previous year (€ 8.4 million). All in all, several factors affected the result for the first nine months of the year. The income trend is positive in the rest of Europe, particularly in Belgium and Italy. In contrast, our predictions were not borne out in the USA and Germany. In the USA, factors such as lower volumes in the packag-ing business impacted on the result. In Germany, increased commodity prices (wood) led to additional expenditure in excess of € 1.5 million. However, the continued slight easing of wood prices in the third quarter and the increasing factoringin of the commodities price trend in our customer relationships give cause for optimism. At the Euskirchen location, lower volumes and a revised product mix adversely affected the result. In addition, reinforcement of central control and services led to temporarily higher administrative expenses since decentralized capacities can only be wound down with a time lag. Earnings before taxes (EBT) as of September 30 amounted to € 4.7 million (previous year: € 5.4 million). After income tax expenses (€ 2.0 million) the result is € 2.7 million, compared to € 3.6 million in the first nine months of 2010. After deduction of the profit shares of noncontrolling interests (€ 0.4 million), a net profit of € 2.2 million (previous year: € 3.3 million) is attributable to the shareholders of Deufol AG. Earnings per share for the first nine months of the year amounted to € 0.051 (previous year: € 0.075). In late October the Deufol Group reorganized its financing structures. It mainly did so in order to repay existing loans but also increased its credit facility by approx. € 10 million. This financing safeguards medium-term liquidity requirements and provides scope for growth for the Group. The cash flow provided from operating activities in the first nine months of the current fiscal year amounted to € 4.5 million (previous year: € 9.9 million). This decline is predominantly due to the cut-off date-related € 7.5 million increase in trade receivables. In the same period in the previous year, trade receivables decreased by € 0.4 million while increasing cash flow. The financial indebtedness of the Deufol Group decreased in the first nine months of the year by € 4.5 million to € 73.7 million. As cash and financial receivables simultaneously decreased (– € 9.4 million) net financial liabilities rose by € 4.9 million, from € 49.3 million at the end of the year to € 54.2 million. With a slightly higher balance sheet total, the equity ratio stood at 44.0 % after 43.6 % at the end of last year. In the context of the figures for the first nine months, we are revising our target earnings for fiscal year 2011. We now predict an operating result (EBITA) of between € 10 million and € 12 million (previously € 12 to 14 million). We continue to predict sales in a corridor between € 310 million and 325 million. With effect as of January 1, 2012, Dr. Tillmann Blaschke will also assume overall responsibility for Finance in addition to Personnel, IT, Real Estate and Investor Relations. The current Chief Financial Officer, Mr. Tammo Fey, is to retire from the Executive Board upon expiry of his contract at the end of the year and will continue to serve the Company in an executive capacity. Detlef W. Hübner is to assume the position of Chief Operating Officer (COO) to align our operations and give them an innovative and competitive direction for the future. Furthermore he will also centrally coordinate Purchasing which was previously generally managed in a decentralized form. The CEO Mr. Andreas Bargende is now responsible for Business Development, Communications, Legal and Compliance. Total sales in the second quarter of 2011 were at € 77.4 million 2.4 % above the same period in the previous year. Adjusted for changes due to acquisitions, this means organic growth of 0.8 %. In Germany sales rose to € 43.2 million, an increase of 7.2 % on the same quarter in the previous year, and in the rest of Europe they increased to € 21.9 million (+ 8.1 %). In the USA, at € 12.1 million sales were 18.4 % lower than in the previous year. Total sales in the first six months of 2011 were at € 153.1 million 4.6 % higher than in the same period in the previous year. Adjusted for acquisitions, this means organic growth of 3.4 %. If one also takes into consideration the US dollar’s depreciation against the euro of 5.6 % on average, the increase amounts to 4.3 %. With a 56.0 % share of Group sales, the proportion accounted for by Germany increased by 2.3 percentage points on the previous year. The share of sales realized elsewhere in Europe increased slightly, from 27.8 % to 28.2 %, and the USA’s share of sales fell by 2.7 percentage points to 15.7 %. At € 2.970 million, the operating result (EBITA) in the second quarter was slightly higher than in the same period in the previous year (€ 2.966 million). The individual segments performed as follows: In Germany we recorded an EBITA decrease of 45.6 % to € 1.31 million. In the rest of Europe EBITA increased by 123.3 % to € 2.32 million. The USA / Rest of the World segment realized an operating result of € 0.17 million (previous year: € 0.15 million). At € 4.64 million, EBITA in the first six months of 2011 were 9.8 % below the level for the same period in the previous year (€ 5.15 million). All in all, several factors affected the result in the first half of the year. The increased contribution to earnings made by the European companies, especially in Belgium and Italy, had a positive effect. In annual comparison in contrast, the increase in commodity prices (wood) and materials prices drove up expenses by over € 1.0 million in Germany. However, the relaxation in the prices of several types of wood in the second quarter and the successive incorporation of higher commodity prices in our customer relationships give cause for optimism. Lower volumes at two German packaging sites also placed a strain on the result. Measures to raise efficiency were implemented and renegotiations of customer contracts initiated to counter this problem. Financial results increased on the same six-month period in the previous year from – € 2.18 million to – € 1.90 million. This is primarily due to lower finance costs which had declined by € 0.26. Earnings before taxes (EBT) as per June 30 amounted to € 2.74 million (previous year: € 2.97 million). After income tax expenses (€ 1.45 million), the result is € 1.29 million, compared to € 1.80 million in the first six months of 2010. After deduction of the profit shares of noncontrolling interests (€ 0.27 million), there is a net profit of € 1.02 million (previous year: € 1.57 million) attributable to the shareholders of Deufol AG. Earnings per share in the first six months were € 0.023 (previous year: € 0.036). The cash flow provided from operating activities in the first six months of the current fiscal year amounted to € 4.38 million (previous year: € 7.85 million). This change is predominantly due to the cut-off date-related € 2.33 million increase in trade receivables. In the previous year’s period, the trade receivables had declined by € 3.78 million while raising the cash flow figure. The financial indebtedness of the Deufol Group decreased in the first six months of the fiscal year by € 1.3 million to € 76.9 million. As cash and financial receivables simultaneously decreased (– € 3.6 million), the net financial liabilities rose slightly (+ € 2.3 million). With a slightly lower balance sheet total, the equity ratio stood at 43.4 % after 43.6 % at the end of last year. Deufol AG confirms its planning figures published for fiscal year 2011 in its annual financial report. These envisage sales in a corridor between € 310 million and € 325 million and an operating result (EBITA) of between € 12 million and € 14 million. In our view the current turmoil on the financial markets will not have a negative impact on the business of Deufol Group. Stable customer relationships and a solid financing provide the foundation for the further expansion of our business. The Supervisory Board of Deufol AG today unanimously appointed Dr. Tillmann Blaschke (48) as a new member of the Executive Board. Tillmann Blaschke will be responsible for the areas Capital Markets, Human Resources and IT. His Executive Board contract will become effective on July 1st, 2011 and has a duration of three years. The doctor of economics has been active at universities and in consulting for the past two years, focusing on Corporate Management and Human Resources Management. Previously, Tillmann Blaschke worked as Commercial Executive Board Member at the IT service provider PC-Ware Information Technologies AG, Leipzig, for over three years, where he was responsible for Finance, Investor Relations, IT and Human Resources, among others. Overall, Tillmann Blaschke brings over 15 years of management and group experience from trade, production and service sectors to the Deufol Group. The addition of Dr. Blaschke to the Board will support the strategic further development of IT customer solutions within the operative units and human resource processes to secure the continued growth and internationalisation of the Group. Tillmann Blaschke, together with Andreas Bargende (48), Tammo Fey (48) and Detlef W. Hübner (56), will form the new Executive Board of Deufol AG. Chairman of the Board Andreas Bargende will be responsible for operations, business development, internal revision and group communication. Finance Director Tammo Fey is responsible for accounting and group controlling, while Detlef W. Hübner advances the strategic objectives of the Group. Total sales in the first quarter of 2011 were at € 75.8 million 7.0 % higher than in the same period in the previous year. Adjusted for changes due to acquisitions, this means organic growth of 6.3 %. If one also takes into consideration the US dollar’s appreciation against the euro of 1.3 % on average, the increase amounts to 6.0 %. In Germany sales rose to € 42.5 million, growth of 11.2 % on the same quarter in the previous year, and in the rest of Europe they increased to € 21.3 million (+ 4.3 %). In the USA, at € 12.0 million sales were 1.8 % (3.0 % on a currency-adjusted basis) lower than in the previous year. With a 56.1 % share of Group sales, the proportion accounted for by Germany increased by 2.1 percentage points on the previous year. The share of sales realized elsewhere in Europe decreased slightly, from 28.8 % to 28.1 %, and the USA’s share of sales fell by 1.4 percentage points to 15.8 %. The operating result (EBITA) in the first quarter was at € 1.67 million 23.4 % below the level for the same period in the previous year (€ 2.18 million). The decrease of € 0.5 million is mainly due to three effects: start-up losses of € 0.2 million for the new location in Roverbella (Italy), additional expenditure in the amount of € 0.1 million associated with the expansion of the Group’s gift card business in the USA and increased commodities (wood) and materials prices. These price rises led to an increase of at least € 0.5 million in expenditure. We are in talks with our customers, that if commodity prices remain high, to pass on gradually these higher purchasing costs. Likewise, the highly positive orders position for the remainder of this year will be reflected in an improved result in relation to the previous year. The individual segments performed as follows: In Germany we recorded an EBITA decrease of 34.1 % to € 1.36 million. In the rest of Europe EBITA increased by 39.7 % to € 1.26 million. The USA / Rest of World segment realized an operating loss of € 0.42 million (previous year: – € 0.23 million). The EBITA loss of Deufol AG (Holding) was € 0.58 million (previous year: € 0.56 million). Financial results showed a slight increase compared to the previous year, from – € 1.02 million to – € 0.94 million. This is attributable to slightly lower financial expenses and a slightly higher share of earnings accounted for by associates. Financial income was virtually unchanged at € 0.35 million. Earnings before taxes (EBT) in the first quarter were € 0.73 million (previous year: € 1.16 million). After income tax expenses (€ 0.50 million) the result is € 0.23 million, compared to € 0.75 million in the first quarter of 2010. After deduction of the profit shares of non-controlling interests (€ 0.12 million), there is a net profit of € 0.12 million (previous year: € 0.63 million) attributable to the shareholders of Deufol AG. Earnings per share in the first quarter were € 0.003 (previous year: € 0.014). The first-quarter cash flow provided by operating activities amounted to € 2.46 million and was thus significantly higher than the level in the previous year (€ 1.35 million). The financial indebtedness of the Deufol Group decreased in the first three months of the fiscal year by € 0.4 million to € 77.8 million. As cash and financial receivables simultaneously decreased (– € 1.9 million), the net financial liabilities rose by € 1.5 million, from € 49.3 million at the end of the year to € 50.8 million. On the liabilities side, equity (including non-controlling interests) fell in the first three months of 2011 on balance by € 0.5 million to € 98.5 million. This was due to other comprehensive income (– € 0.6 million). With a slightly increased balance-sheet total, the equity ratio decreased from 43.6 % to 43.4 %. Deufol AG today published its annual accounts for the year 2010 an looks back on a significant business year. On June 22, a landmark decision was made at the Annual General Meeting: D.Logistics AG was renamed Deufol AG. In 2010, we consistently executed this change of name and the associated umbrella brand strategy and have now almost completed this process. To let the stockholders participate appropriately in the company's success, the Board of Management and the Supervisory Board will recommend to the Annual Stockholders' Meeting on June 29, 2011, a dividend for fiscal 2010 of € 0.03 per share. In an economic environment showing a positive overall trend, in the reporting period sales increased by 5.9 % on the previous year to € 307.1 million. We thus achieved our planning targets, which had envisaged sales in excess of € 300 million. If the sales trend is adjusted for the changes in the scope of consolidation, this shows organic growth of 7.7 %. If one also takes into consideration the US dollar’s appreciation against the euro of around 5 % on average, this represents adjusted growth of 6.6 %. In the past year, Industrial Goods Packaging maintained its position as the area of activity providing the largest volume of sales for the Deufol Group. With slightly increased sales (+ 2.2 % to € 140.1 million) in 2010, it contributed 45.6 % (previous year: 47.3 %) to Group sales. In the second-strongest segment, Consumer Goods Packaging, sales increased significantly(+ 11.1 % to € 119.8 million) in the reporting period, providing 39.0 % (previous year: 37.2 %) of Group sales. However, this rise was unevenly distributed among the Group’s regions, with + 5.2 % in Belgium, – 9.6 % in Italy and + 24.4 % in the USA. The dollar’s appreciation was a positive factor in the USA; US sales rose 18.2 % in local-currency terms. In Warehouse Logistics, sales increased 4.8 % to € 46.9 million. This means that this segment now represents around 15.3 % (previous year: 15.4 %) of Group activities. This relatively low increase is due to the disposal of Air Cargo Wings GmbH (previously D.Logistics Airport Services GmbH) in mid-2009; adjusted for this disposal, the rise in sales amounts to 17.4 %. In the past fiscal year, the gross profit increased by 23.4 % to € 37.5 million. The gross margin thus increased to 12.2 % compared to 10.5 % in 2009. Personnel costs in particular decreased while the cost of materials rose especially strongly. Earnings before interest, taxes, depreciation and amortization (EBITDA) were € 20.0 million, compared to € 16.2 million in the previous year. The EBITA margin reached 6.5 %, compared to 5.6 % in 2009. Depreciation of property, plant and equipment declined slightly and amounted to € 8.2 million (previous year: € 8.5 million), amortization of other intangible assets marginally declined from € 1.3 million to € 1.2 million. In the period under review, the operating result before goodwill amortization (EBITA) increased by 65.7 % to € 10.6 million and thus exceeded our original planning target of € 10 million but fell short of our revised planning goal of € 11 million. This was due to unscheduled expenses not resulting from operational business in the amount of € 0.8 million. They split into consumption-tax back payments resulting from external audits (€ 0.3 million), an additional valuation adjustment on an item of real estate in the USA (€ 0.2 million) and valuation adjustments on receivables from the VAT group against the deconsolidated BVU GmbH (€ 0.3 million). The EBITA margin was 3.5 % in 2010, compared to 2.2 % in 2009. Earnings before taxes amounted to € 6.3 million in the past year and were thus significantly above the level in 2009 (– € 0.4 million). In the past fiscal year, on balance the overall tax expenditure amounted to € 3.0 million compared to tax proceeds of € 1.1 million in the previous year. Current tax expenditure for taxes on income increased from € 3.2 million to € 3.4 million. For the deferred taxes, income of € 0.4 million was recorded, compared to € 4.4 million in 2009. In 2009, this item was affected by the recognition of deferred taxes in the amount of € 2.9 million due to the profit and loss transfer agreement between Deufol AG and Deufol Tailleur GmbH. As a consequence of this agreement, tax income recorded by Deufol Tailleur GmbH can be partially offset against tax losses carried forward by Deufol AG. This means a result of € 3.3 million (previous year: € 0.7 million). The profit share for non-controlling interests amounts to € 0.4 million as in the previous year. The profit attributable to the shareholders of Deufol AG amounted to € 2.9 million in the period under review, compared to € 0.4 million in the same period in the previous year. Earnings per share were € 0.061 in 2010 (previous year: € 0.008). The operating cash flow amounted to € 19.9 million in the period under review and was thus 32.3 % higher than the level in the previous year (€ 15.1 million). In the past fiscal year, the financial liabilities of the Deufol Group decreased slightly, from € 78.8 million to € 78.2 million. Net financial liabilities – defined as the total financial liabilities less financial receivables and cash – increased by € 1.8 million from € 47.5 million on December 31, 2009 to € 49.3 million at the end of the period under review. This increase resulted despite the increase in cash held (+ € 2.0 million) due to a decrease in financial receivables (– € 4.4 million). At the end of fiscal year 2010, the Deufol Group’s equity was at € 99.0 million € 3.9 million higher than the previous year’s level (€ 95.1 million), this is equivalent to € 2.26 per share. Since the balance sheet total fell, this led to an increase in the equity ratio from 40.3 % to 43.6 %. At the time of writing it is not yet possible to assess the effects which the dramatic events currently unfolding in Japan will have on the overall economic picture. However, in the context of a continuing economic recovery the Deufol Group predicts sales in a corridor between € 310 million and € 325 million for fiscal year 2011. Its operating result (EBITA) will be between € 12 and 14 million. With regard to the sales trend, we predict growth in Export & industrial Goods Packaging and in the Gift Cards & Data Management segment. For our other services, we expect unchanged or slightly higher sales, even though experience shows that it is difficult to provide a forecast for autumn seasonal business in Automated Packaging and Promotional & Display Packaging. In terms of the earnings outlook, in Export & industrial Goods Packaging we expect to see a significant rise and a further improvement in our business in the USA. Total sales in the third quarter of 2010 were at € 78.95 million 6.1 % above the same period in the previous year. In Industrial Goods Packaging, sales were 2.4 % stronger than in the same quarter in the previous year, while in the Consumer Goods Packaging segment, sales were 8.7 % higher than in the previous year, not least due to the strong improvement in the USA. In the Warehouse Logistics segment, sales rose by 12.5 %. In the first nine months, at € 225.2 million, sales were 4.6 % higher than in the same period in the previous year. Adjusted for changes to the consolidated group, this means organic growth of 7.0 %. Allowing for currency fluctuations, the growth rate amounts to approx. 6.2 %. At € 3.22 million, the operating result (EBITA) in the third quarter was 39.1 % higher than in the same period in the previous year (€ 2.32 million). At € 5.37 million, earnings before interest, taxes, depreciation and amortization (EBITDA) were 20.2 % higher than in the same quarter in the previous year. The EBITDA margin was 6.8 % (previous year: 6.0 %). Depreciation of tangible assets and amortization of other intangible assets were almost unchanged, at € 2.14 million. The individual segments performed as follows: Industrial Goods Packaging recorded an EBITA decrease of 8.2 % to € 1.68 million. In Consumer Goods Packaging, EBITA more than quadrupled, at € 1.36 million (previous year: € 0.30 million). Warehouse Logistics recorded an operating profit of € 0.65 million (previous year: € 0.48 million). The EBITA loss of D.Logistics AG (Holding) was € 0.39 million (previous year: € 0.34 million). In the first nine months of the year, the Group EBITA of € 8.37 million are 64.3 % higher than in the same period in the previous year (€ 5.09 million). Earnings before taxes (EBT) in the third quarter amounted to € 2.47 million (previous year: € 1.13 million) and in the first nine months to € 5.44 million (previous year: € 2.05 million). After tax expenses (€ 0.66 million), and third-party profit shares (€ 0.11 million), there is a net profit of € 1.71 million (previous year: € 0.48 million) in Q3 attributable to the shareholders of D.Logistics AG. The cumulative profits for the shareholders of D.Logistics AG as of September 30, 2010 amounted to € 3.28 million (previous year: € 0.62 million). The earnings per share in the second quarter were € 0.039 (previous year: € 0.011); in the nine months, they reached € 0.075 (previous year: € 0.014). The third-quarter net cash provided by operating activities was € 2.1 million (previous year: € 3.81 million).and after six months it reached € 9.92 million (previous year: € 9.39 million). The financial indebtedness of the D.Logistics Group decreased in the first nine months of the fiscal year by € 1.0 million to € 77.8 million. Since cash and financial receivables simultaneously decreased by the same amount (– € 1.0 million), net financial liabilities remained unchanged at € 47.5 million. The equity ratio stood at 41.2 % compared to 39.4 % at the end of 2009. D.Logistics AG raises its target sales and earnings for fiscal year 2010 published in its annual financial report. Sales in excess of € 300 million and operating earnings (EBITA) in excess of € 11 million are now predicted. The previous planning envisaged sales of between € 280 million and € 300 million and operating earnings in excess of € 10 million. Total sales in the second quarter of 2010 were at € 75.5 million 8.2 % above the same period in the previous year. If the sales trend is adjusted for the changes to the consolidated group (sale of D.Logistics Airport Services GmbH), this represents organic growth of 12.4 %. In Industrial Goods Packaging, sales were 3.8 % stronger than in the same quarter in the previous year, while in the Consumer Goods Packaging segment, sales were 19.2 % higher than in the previous year, not least due to the strong improvement in the USA. In the Warehouse Logistics segment, sales decreased by 2.6 %, but after adjustment for the airport business an increase of 23.4 % resulted. In the first six months, at € 146.3 million, sales were 3.8 % higher than in the same period in the previous year. Adjusted for changes to the consolidated group, this means organic growth of 7.4 %. Allowing for currency fluctuations, the growth rate also amounts to approx. 7.4 %. At € 2.97 million, the operating result (EBITA) in the second quarter was 146.6 % above the level for the same period in the previous year (€ 1.20 million). At € 5.20 million, earnings before interest, taxes, depreciation and amortization (EBITDA) were 47.2 % higher than in the same quarter in the previous year. The EBITDA margin was 6.9 % (previous year: 5.1 %). Depreciation of tangible assets and amortization of other intangible assets decreased from € 2.33 million to € 2.23 million. The individual segments performed as follows: Industrial Goods Packaging recorded an EBITA decrease of 24.0 % to € 1.95 million. In Consumer Goods Packaging, EBITA amounted to € 0.98 million, compared to a loss of € 0.34 million in the previous year. Warehouse Logistics recorded an operating profit of € 0.66 million (previous year: – € 0.62 million). Besides the improved business trend, the end to the losses resulting from the airport business and the start-up losses in Euskirchen were further positive factors here. The EBITA loss of D.Logistics AG (Holding) was € 0.65 million (previous year: € 0.39 million). In the first half of the year, the Group EBITA of € 5.15 million is 85.2 % higher than in the same period in the previous year (€ 2.78 million). Earnings before taxes (EBT) in the second quarter amounted to € 1.81 million (previous year: € 0.30 million) and in the first six months to € 2.97 million (previous year: € 0.91 million). After tax expenses (€ 0.74 million) and third-party profit shares (€ 0.11 million), there is a net profit of € 0.94 million (previous year: € 0.02 million) attributable to the shareholders of D.Logistics AG. The cumulative profits for the shareholders of D.Logistics AG as of June 30, 2010 amounted to € 1.56 million (previous year: € 0.14 million). The earnings per share in the second quarter were € 0.021 (previous year: € 0.000); in the first half-year, they reached € 0.036 (previous year: € 0.003). The second-quarter net cash provided by operating activities was € 6.50 million (previous year: € 4.13 million) and after six months it reached € 7.85 million (previous year: € 5.59 million). The financial indebtedness of the D.Logistics Group decreased in the first six months of the fiscal year by € 1.1 million to € 77.8 million. As cash and financial receivables simultaneously increased (+ € 2.8 million), the net financial liabilities fell more significantly, by € 3.9 million, from € 47.5 million at the end of the year to € 43.6 million. The equity ratio stood at 40.7 % compared to 39.4 % at the end of 2009. D.Logistics AG confirms its planning figures published for fiscal year 2010 in its annual financial report. These envisage sales in a corridor between € 280 million and € 300 million and an operating result (EBITA) in excess of € 10 million. However, with regard to the sales trend the business performance to date means that there is still a possibility of exceeding the upper limit of the forecast range. At € 70.8 million, total sales in the first quarter of 2010 were 0.6 % lower than in the same period in the previous year. If the sales trend is adjusted for the changes to the consolidated group (sale of D.Logistics Airport Services GmbH), this represents organic growth of 2.8 %. If one also takes into consideration the US dollar’s depreciation against the euro of 6 % on average, the increase amounts to 3.9 %. The operating result (EBITA) in the first quarter was at € 2.18 million 38.3 % above the level for the same period in the previous year (€ 1.58 million). At € 4.35 million, earnings before interest, taxes, depreciation and amortization (EBITDA) were 11.0 % higher than in the same quarter in the previous year. The EBITDA margin was 6.2 % (previous year: 5.5 %). Depreciation of tangible assets and amortization of other intangible assets decreased from € 2.35 million to € 2.12 million. The individual segments performed as follows: Industrial Goods Packaging recorded an EBITA decrease of 23.8 % to € 1.95 million. In Consumer Goods Packaging, EBITA amounted to € 0.37 million, compared to a loss of € 0.23 million in the previous year. Warehouse Logistics recorded an operating profit of € 0.42 million (previous year: – € 0.46 million). Besides the improved business trend, the end to the losses resulting from the airport business and the start-up losses in Euskirchen were further positive factors here. The EBITA loss of D.Logistics AG (Holding) was € 0.56 million (previous year: € 0.24 million). Earnings before taxes (EBT) in the first quarter were € 1.16 million (previous year: € 0.60 million). After income tax expenses (€ 0.40 million) and the deduction of the third-party profit shares (€ 0.13 million), there is a net profit of € 0.62 million attributable to the shareholders of D.Logistics AG (previous year: € 0.12 million). Earnings per share in the first quarter were € 0.014 (previous year: € 0.003). The first-quarter cash flow provided by operating activities amounted to € 1.35 million and was thus roughly at the same level as in the previous year (€ 1.45 million). The financial indebtedness of the D.Logistics Group increased in the first three months of the fiscal year by € 1.8 million to € 80.5 million. As cash and financial receivables simultaneously increased (+ € 1.0 million), the net financial liabilities rose more marginally, by € 0.7 million, from € 47.5 million at the end of the year to € 48.2 million. With a slightly increased balance sheet total, the equity ratio increased from 39.4 % to 40.0 %. D.Logistics AG confirms its planning figures for the fiscal year 2010 published in its annual financial report. These envisage sales in a corridor between € 280 and 300 million and an operating result (EBITA) in excess of € 10 million. D.Logistics AG today published its annual accounts for the year 2009 and looks back on a difficult business year. The worldwide recession burdened the sales and earnings figures of the D.Logistics Group, and our US subsidiary in particular recorded a sizeable loss. Yet we realized highly positive results in our strongest segment – Industrial Goods Packaging – and also in Belgium and Italy. However, in the context of the significantly reduced Group result the Executive and Supervisory Boards will propose to the Annual General Meeting that no dividend should be paid out to the shareholders for the fiscal year 2009. In an overall economic environment hit by the financial and economic crisis and marked by recession, in the period under review sales decreased by 13.9 % on the previous year to € 290.1 million and thus fell within the target corridor of € 285 to 300 million. If the sales trend is adjusted for the changes to the consolidated group (sale of D.Logistics Airport Services GmbH) this represents an organic decrease of 12.2 %. If one also takes into consideration the US dollar’s appreciation against the euro of around 5 % on average, the decline is approx. 12.9 %. In the past year Industrial Goods Packaging consolidated its position as the area of activity providing the largest volume of sales for the D.Logistics Group. Despite falling sales (– 11.7 % to € 137.1 million) in 2009, it contributed 47.3 % (previous year: 46.1 %) to Group sales. In the second-strongest segment, Consumer Goods Packaging, sales also fell (– 14.7 % to € 107.8 million) in the reporting period, providing 37.2 % (previous year: 37.5 %) of Group sales. However, this decrease is unevenly distributed across the regions: – 10.9 % in Belgium, – 27.2 % in Italy and – 11.4 % in the USA. In the US the dollar’s appreciation was a positive factor, however; in local-currency terms sales actually fell by 16.0 %. In Warehouse Logistics sales decreased 18.3 % to € 44.8 million. This means that this segment now represents around 15.4 % (previous year: 16.3 %) of Group activities. Besides falling volumes, this decline is also due to the disposal of D.Logistics Airport Services GmbH in the middle of the year. Adjusted for changes to the scope of consolidation, the drop in sales in Warehouse Logistics was only approx. 7.3 %. In the past fiscal year the gross profit decreased by 25.9 % to € 30.4 million. The gross margin thus fell to 10.5 %, compared to 12.2 % in 2008. While in many cases the cost structure was adjusted in line with the reduced sales, this was not possible for personnel costs in particular – whose share of sales increased to 32.6 % (previous year: 31.0 %) – and for space costs. Earnings before interest, taxes, depreciation and amortization (EBITDA) were € 16.2 million, compared to € 24.0 million in the previous year. The EBITDA margin reached 5.6 %, compared to 7.1 % in 2008. Depreciation of property, plant and equipment remained largely constant, at € 8.5 million, and amortization of other intangible assets rose slightly, from € 1.2 million to € 1.3 million. In the period under review the operating result before impairment of goodwill (EBITA) decreased by 55.9 % to 6.4 million and was thus approx. 8.0 % below the lower limit of our planning corridor. The EBITA margin reached 2.2 % in 2009, compared to 4.3 % in 2008. In the USA, in view of the poor results we implemented a full valuation adjustment on the allocated goodwill in the amount of € 2.6 million. The operating result after impairment of goodwill was thus € 3.8 million (previous year: € 14.6 million). Earnings before taxes amounted to – € 0.4 million in the past year and were thus significantly below the level in 2008 (€ 9.9 million). In the past fiscal year the tax item recorded on balance income in the amount of € 1.1 million (previous year: € 2.5 million). Despite the lower pre-tax income, current tax expenditure for taxes on income increased from € 2.1 million to € 3.2 million. The reasons for this include significantly increased income tax expense in Italy, following the inflow of the compensation payment. For the deferred taxes income of € 4.4 million was recorded, compared to € 4.6 million in 2008. As well as the recognition of deferred taxes on current losses, this item also reflects the recognition of deferred taxes in the amount of € 2.9 million due to the profit and loss transfer agreement between D.Logistics AG and Deufol Tailleur GmbH. As a consequence of this agreement, tax income recorded by Deufol Tailleur GmbH can be partially offset against tax losses carried forward by D.Logistics AG. This corresponds to a result of € 0.7 million (previous year: € 12.4 million). The profit share for minority shareholders amounts to € 0.4 million, compared to € 0.9 million in the previous year. The profit attributable to the shareholders of D.Logistics AG amounted to € 0.4 million in the period under review, compared to € 11.5 million in the same period in the previous year. Earnings per share were € 0.01 in 2009 (previous year: € 0.26). The operating cash flow amounted to € 15.1 million in the period under review and was thus just 3.9 % below the level in the previous year (€ 15.7 million). In the past fiscal year the financial liabilities of the D.Logistics Group increased slightly, from € 76.1 million to € 78.8 million. Net financial liabilities – defined as the total financial liabilities less financial receivables and cash – fell slightly, by € 1.4 million from € 49.0 million on December 31, 2008 to € 47.5 million at the end of the period under review. This was due to the increase in cash held (+ € 2.7 million) and higher financial receivables (+ € 1.4 million). At the end of fiscal year 2009, the D.Logistics Group’s equity was at € 91.6 million € 5.1 million lower than the previous year’s level (€ 96.7 million); this is equivalent to € 2.09 per share. Since the balance sheet total fell slightly, this led to a decrease in the equity ratio from 40.8 % to 39.4 %. In the context of a merely sluggish economic recovery, for fiscal year 2010 the D.Logistics Group predicts sales in a corridor between € 280 and 300 million. Its operating result (EBITA) should reach more than € 10 million. With regard to the sales trend, we expect the packaging segments to remain nearly constant in relation to the previous year, though experience shows that it is difficult to predict seasonal business in the autumn in Consumer Goods Packaging. In Warehouse Logistics we envisage a noticeable decline in sales due to the smaller consolidated group. In terms of the outlook, in Consumer Goods Packaging we expect significantly improved results which will largely be fueled by the emerging turnaround in America. In Industrial Goods Packaging we assume largely constant EBITA, since it is not clear at the present time whether this segment will once again be able to handle additional project business, which strengthened the income trend in the first half of 2009. Warehouse Logistics we expect a significantly improved result, particularly as the start-up losses incurred in 2009 for the “customization center” in Euskirchen will no longer apply. The third and fourth quarters will be of key significance for the Group operating result trend. Of course, we provide you with additional data and facts about the Deufol Group, if necessary. Please contact Mrs. Claudia Ludwig.